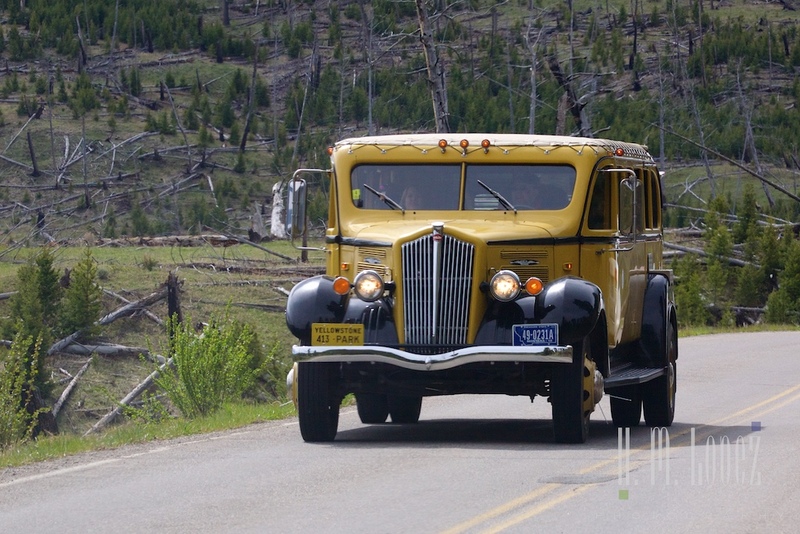 On our move day at Yellowstone National Park, we drove through seven miles of construction, which turned to mud due to recent rains. This was one of the reasons we chose to relocate, to avoid driving through construction zones more than once. 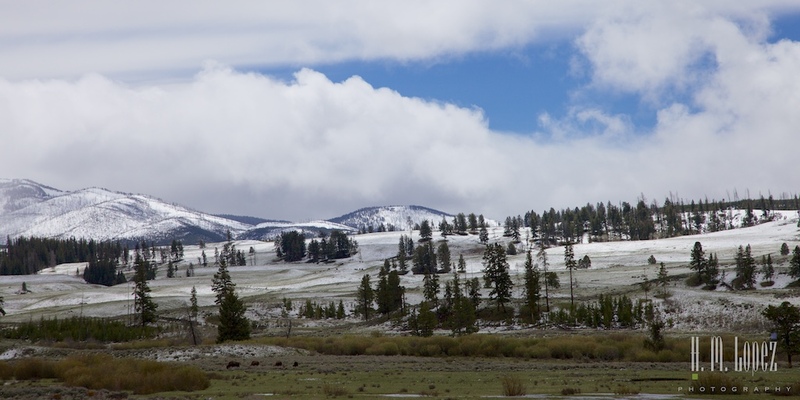 And we wanted to be closer to the Lamar Valley in order to see more Yellowstone wildlife. We stayed at the Mammoth Campground, near the North entrance to the park, which is the original entrance to the park. Read my review of the campground here. Just after we got settled in and as I was finishing a walk with Angel, it began to hail. So far, we had rain, wind, cold, a bit of snow, and now hail. Ah, Spring! 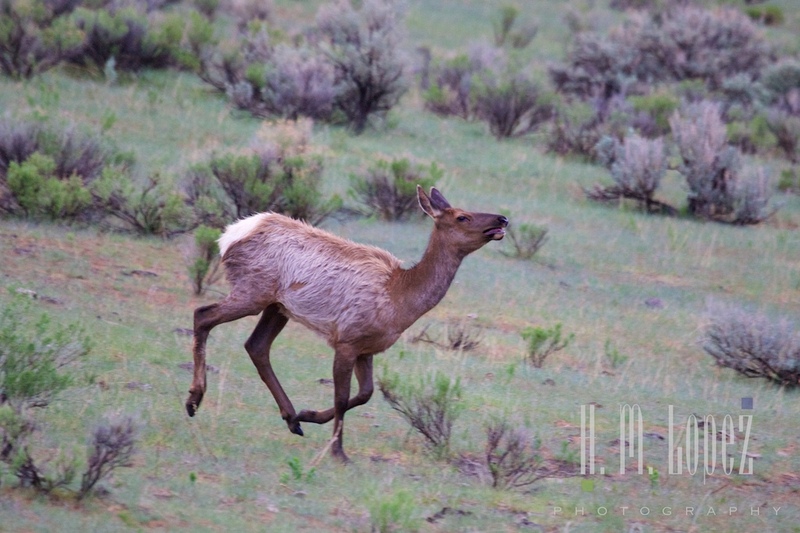 In the morning, there was a herd of elk cows running through the campground. 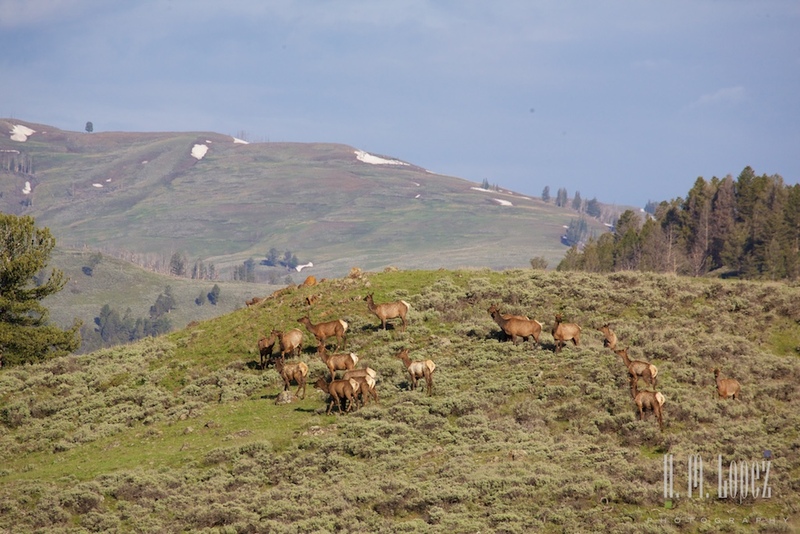 Mammoth Hot Springs is home to many elk, and they hang out around the town and nearby areas. We had seen more wildlife than ever, but some of the best was yet to come. 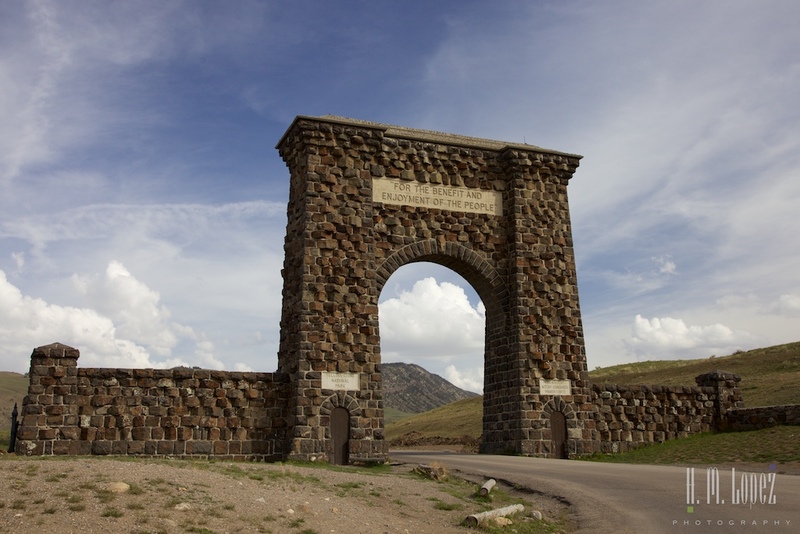 Our campground was a great jumping off point to visit the Tower-Roosevelt area and the Lamar Valley, both east of us. 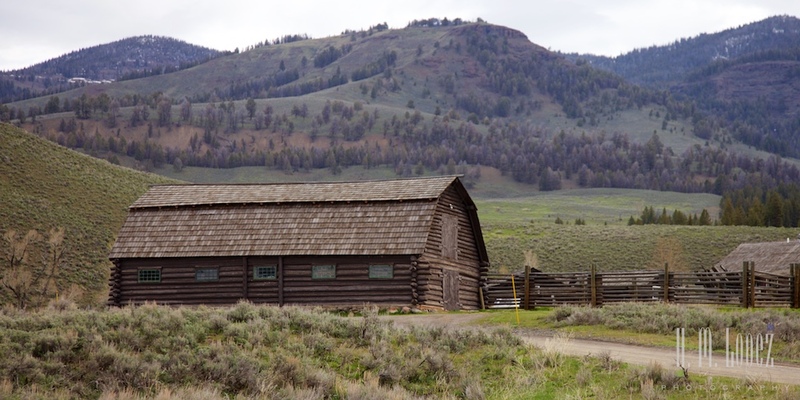 Both areas are known for their bears, both grizzly and black, and the Lamar Valley has the largest number of wolf packs in the park. So off we headed. 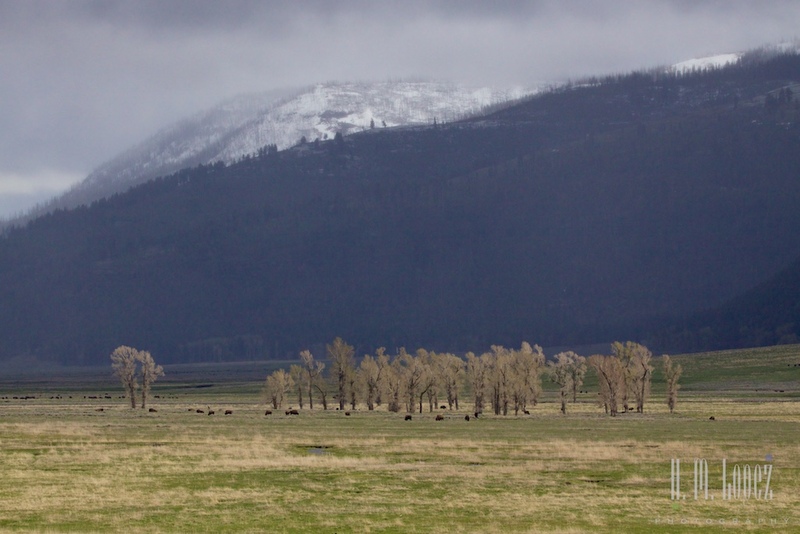 We began to see bison on the way up to the campground and continued to see them on all of our drives. They use the road at times, especially when the sides of the road are steep. 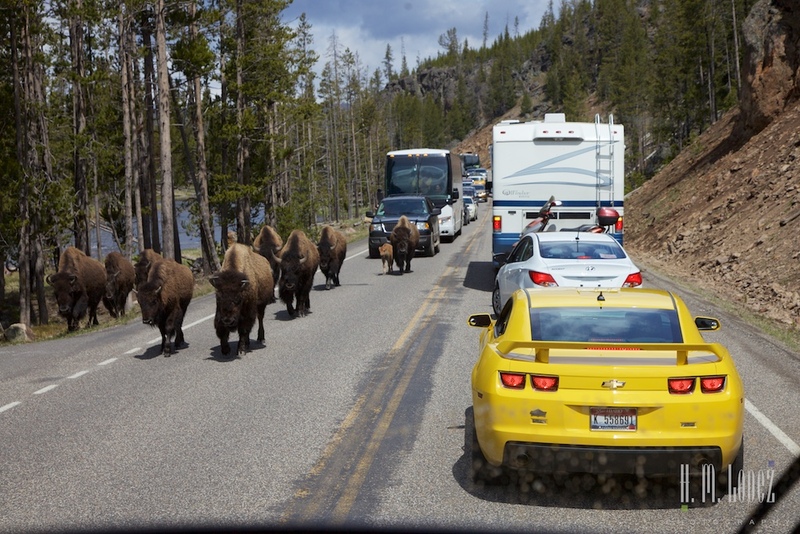 The bison create traffic jams all the time, as they basically ignore the cars stacking up behind them. 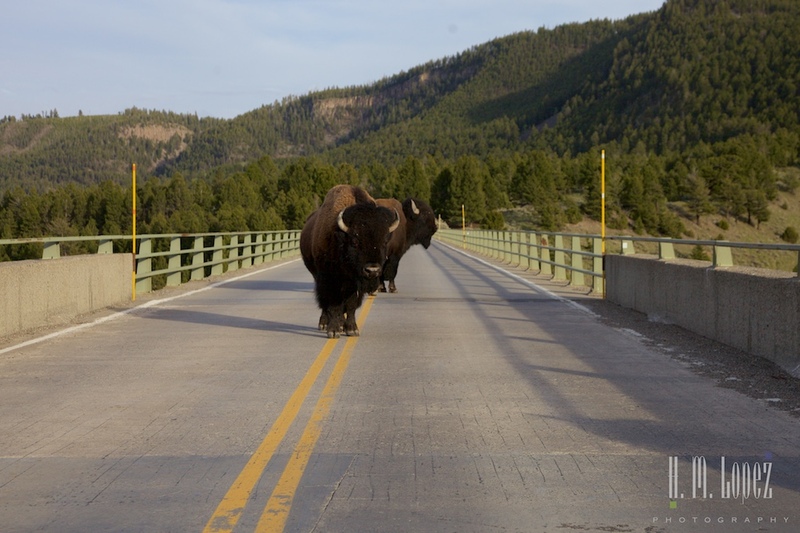 There is one particular bridge that crosses a river above a steep canyon on the way to Tower-Roosevelt that the bison use all the time. 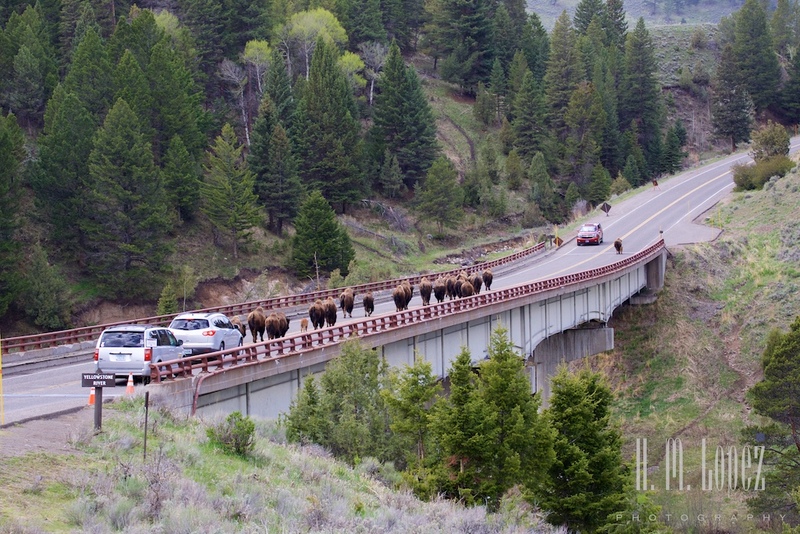 And it is best to sit back and enjoy the sights (and the bison) while they are crossing. 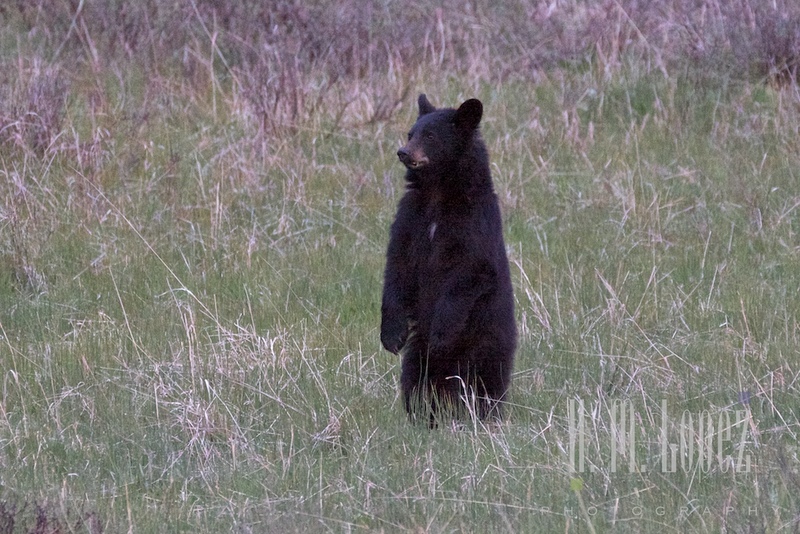 We spotted black bears right away, including sows with cubs. During this second half of our visit to the park, we saw at least four different sows with cubs, and that is assuming we saw a couple of the same ones more than once. One sow had two tiny black cubs, just adorable. The three of them were a bit far off. 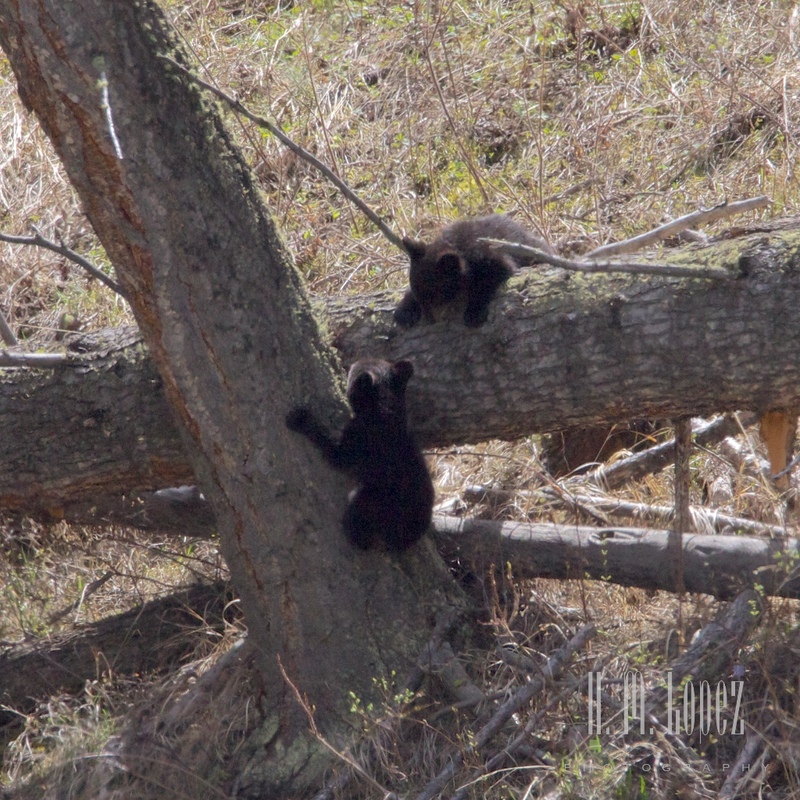 These little cubs were born late this winter so were only about three months old. I still remember mama walking out of the forest into a clearing, alone for a while. Then when she was about halfway out into the open the two little ones literally bounded out after her. They just bounced and rolled along after her. At one point, she sent them up a tree for a bit, then returned to get them. It was great fun to watch them. The next sow we saw had three black cubs; yearlings. Cubs stay with their mothers for about a year and a half. These were not quite as playful as the other two, they were a more focused on eating, but every now and then two played together a bit. Mama ran a little and all three followed. I love the fact that the cubs stick really close to their mothers. There were some media reports and a You-Tube video circulating recently that we think featured these four. Visitors had somehow come between the sow and her cubs and she was running around gathering them and making sure the people steered clear of them. Some media reports named this an “attack” but if you look at the video the black bear does not ever run directly at anyone. Instead, she runs sideways next to them, it is simply a way to keep them separate from her cubs. It is sad that people are careless and allow themselves to get between a bear and her cubs and also sad that it was reported as an attack. 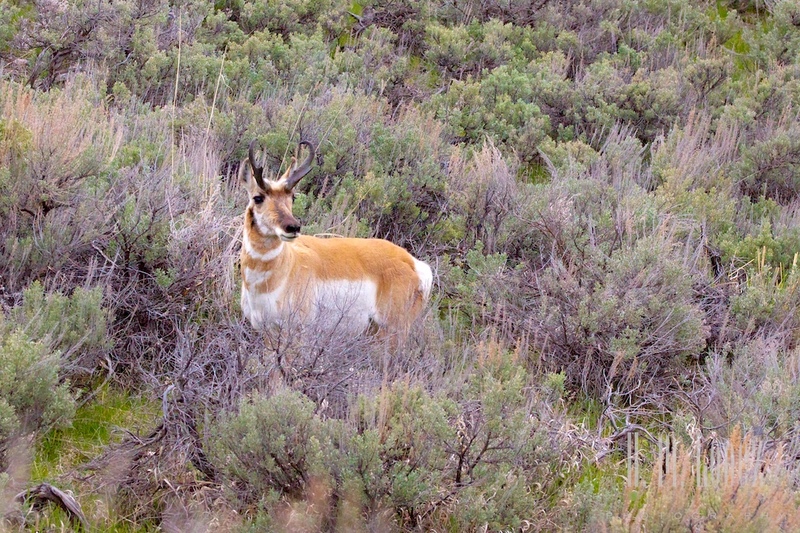 Another animal that fascinates us are the pronghorn, also found throughout this area. 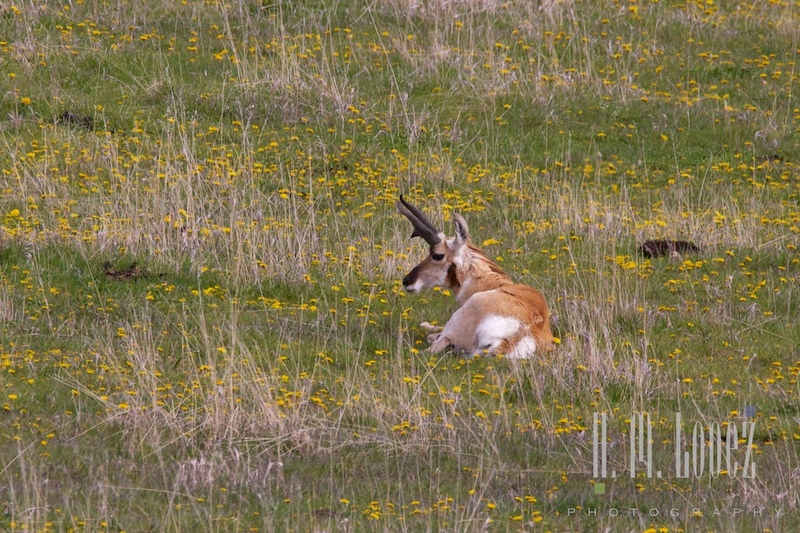 Although thought of as a type of antelope, the pronghorn is the sole surviving species of a family of North American hoofed animals that dates back 20 million years. 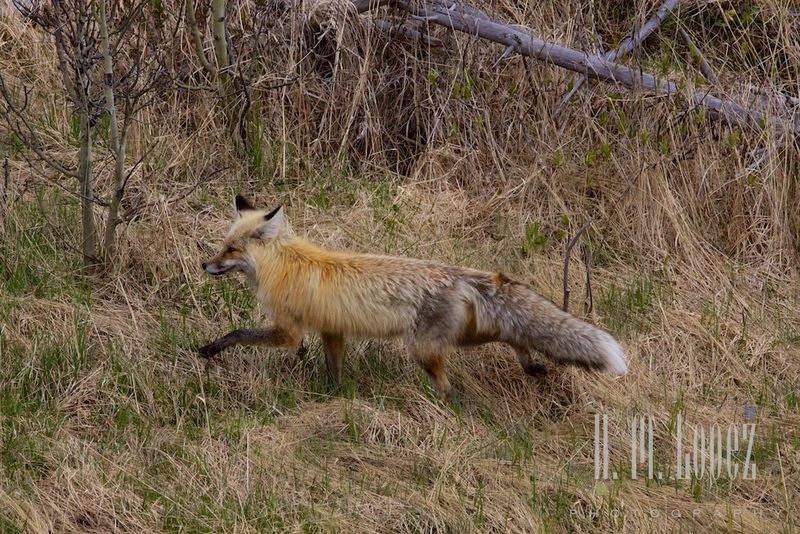 They are the fastest land mammals in North America and thus have no predators. The now extinct North American cheetah used to be its main predator and hold the title of the fastest in North America. 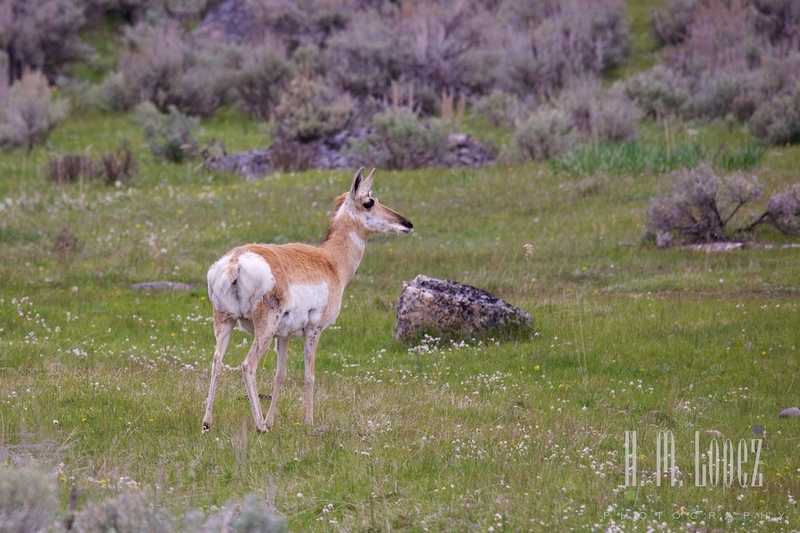 The pronghorn also have a mass migration of 150 miles in the winter to slightly warmer weather. 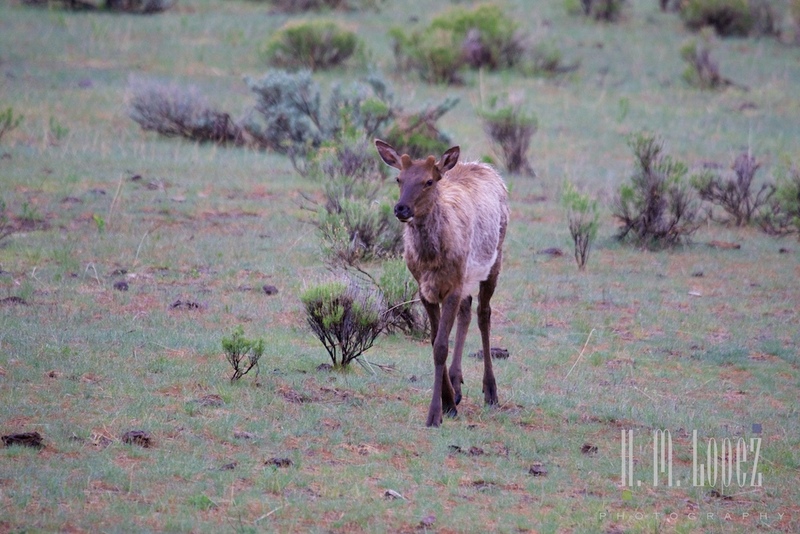 More wildlife sightings included bighorn sheep, what looked like two very young ones, and mule deer, also known as black-tailed deer, including one that looked like a baby that ran off as Hector tried to photograph her. 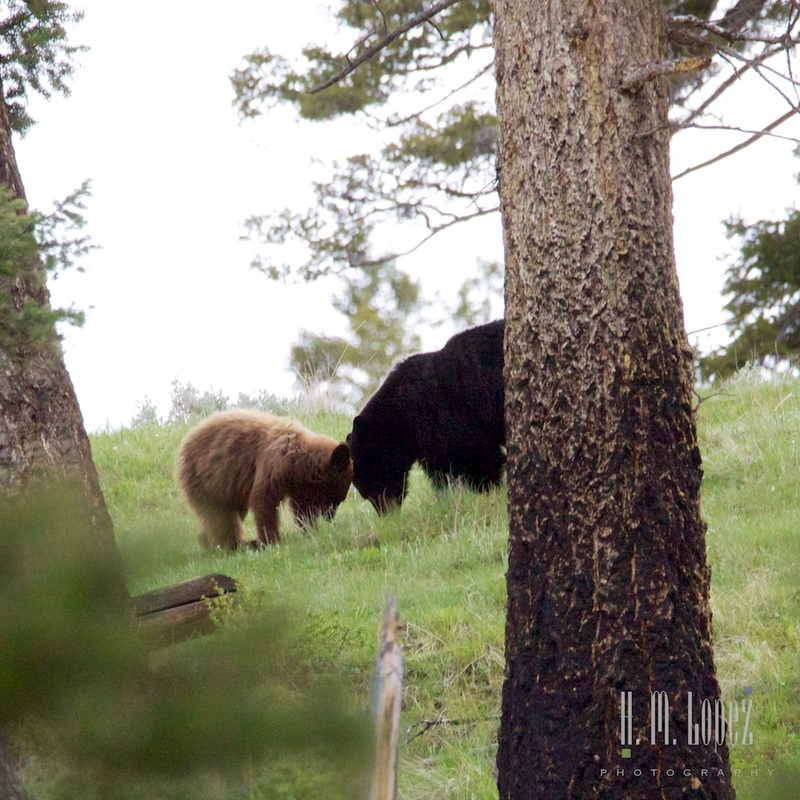 Another day we saw a big beautiful cinnamon colored black bear walking around and feeding. There were many areas closed off due to bear activity. 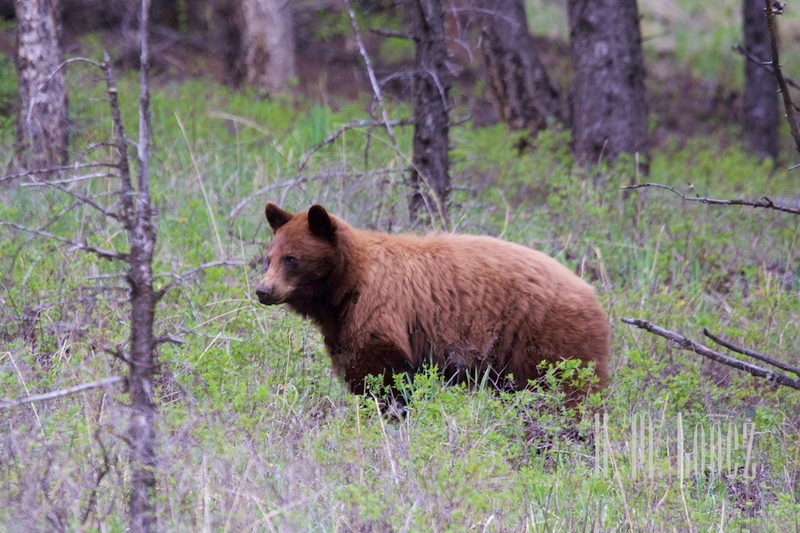 A good time to be careful and carry bear spray. 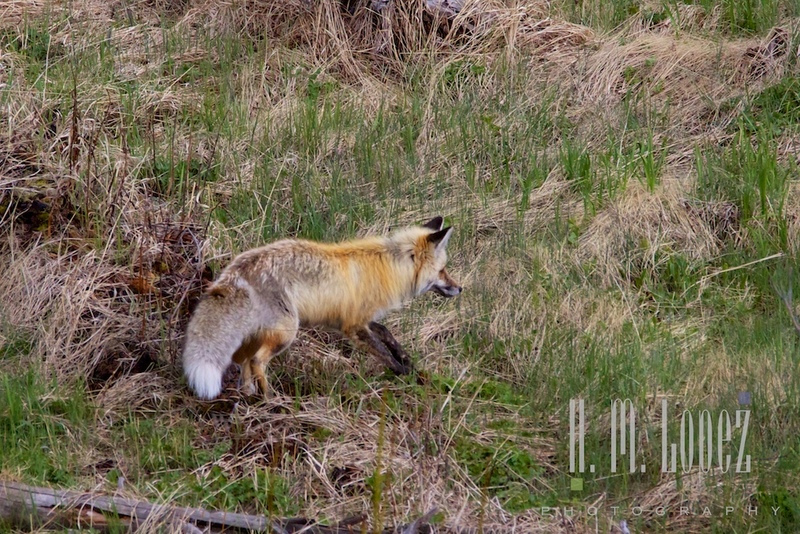 That same day we saw a red fox off the side road that leads to the Petrified Tree. There was a little valley and the fox was down below. 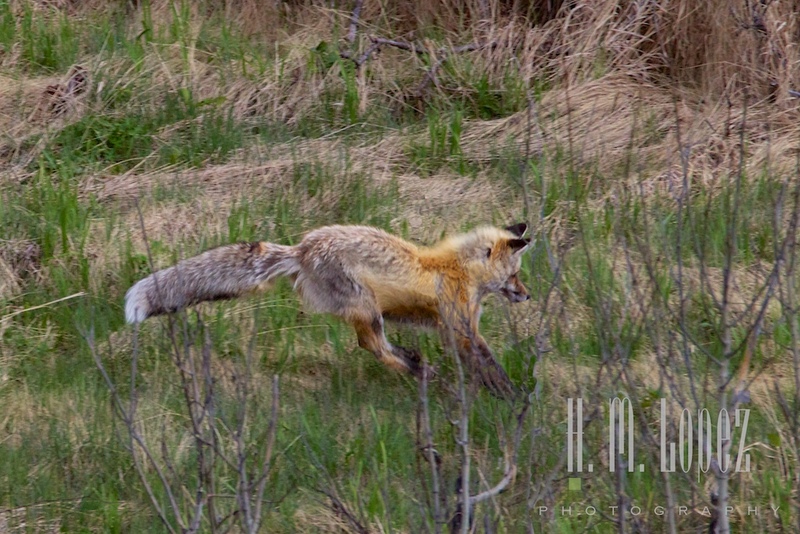 Quite a number of photographers had gathered, and the fox was ignoring the people and busily stalking and hunting prey. She had a magnificient coat, with nimble little legs. The next day we had a second sighting and she was still hunting, eating some and burying others. She was really good at it! 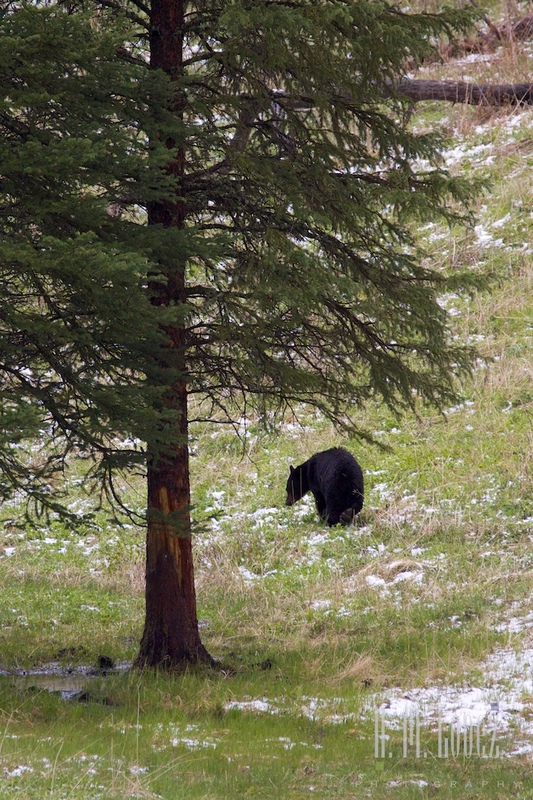 On both occasions, there was also a black bear at the other end of the little valley. All along the way, we saw more bison and calves. The herds are either cows with calves and a few older males, or all male “bachelors”. We continued to enjoy seeing the playful calves, they hop about and play together. 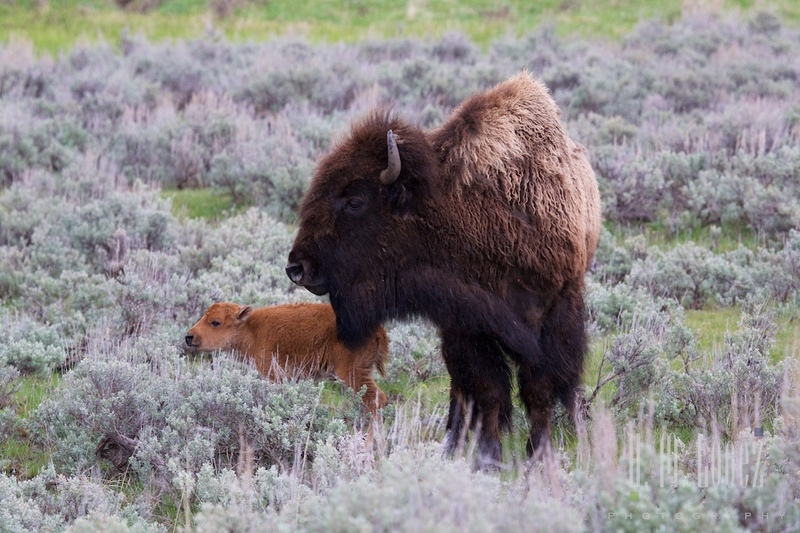 The calves stay with their mothers up to a year old, but begin to become independent several months earlier. 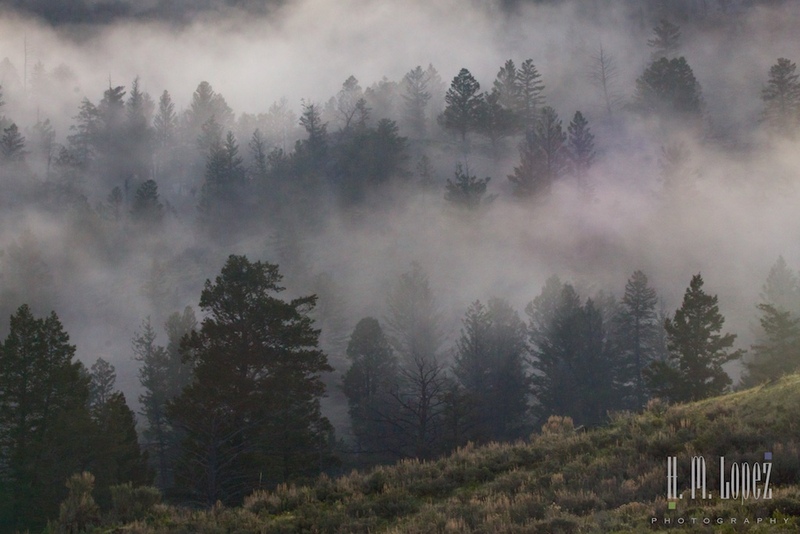 We rose before dawn several mornings to go look for wolves. 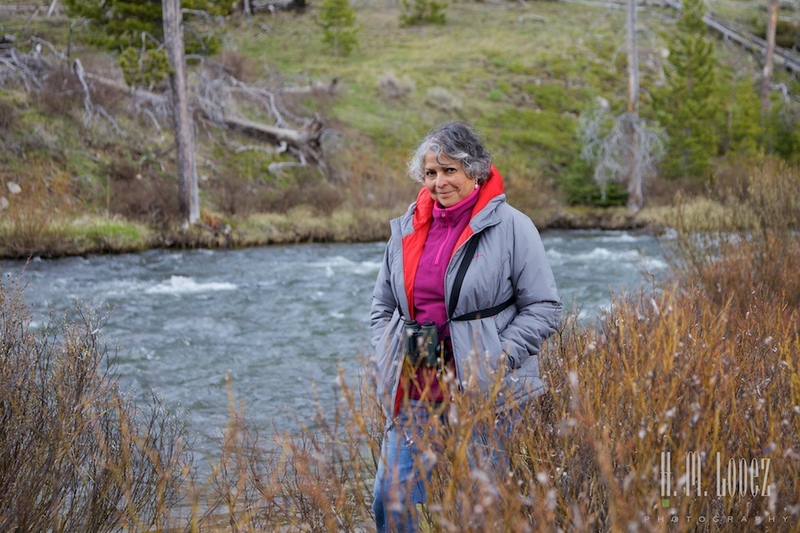 There is a dedicated group of people, some that visit every year looking for wolves and grizzly bears. 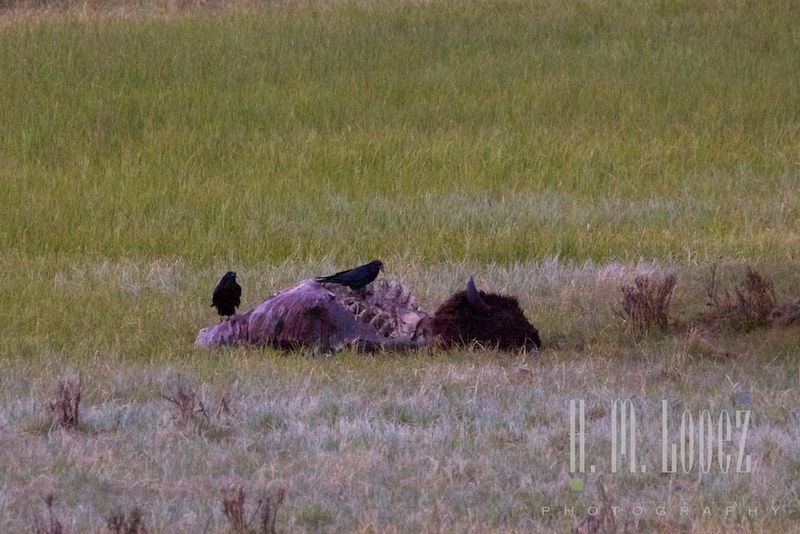 Both wolves and grizzly bears had been spotted eating off a buffalo carcass over in Slough Creek in the Hayden Valley. So we joined the “carcass watchers” on and off as we cruised around. 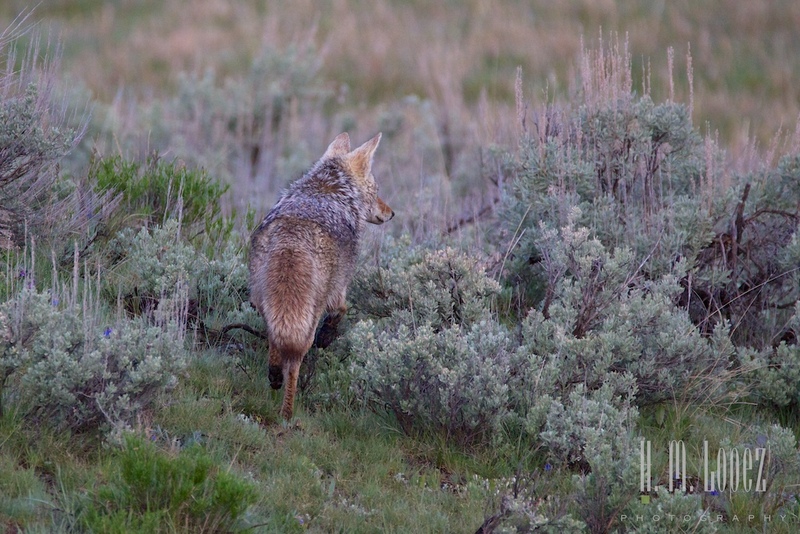 The watchers included a beautiful coyote that casually strolled right by us. 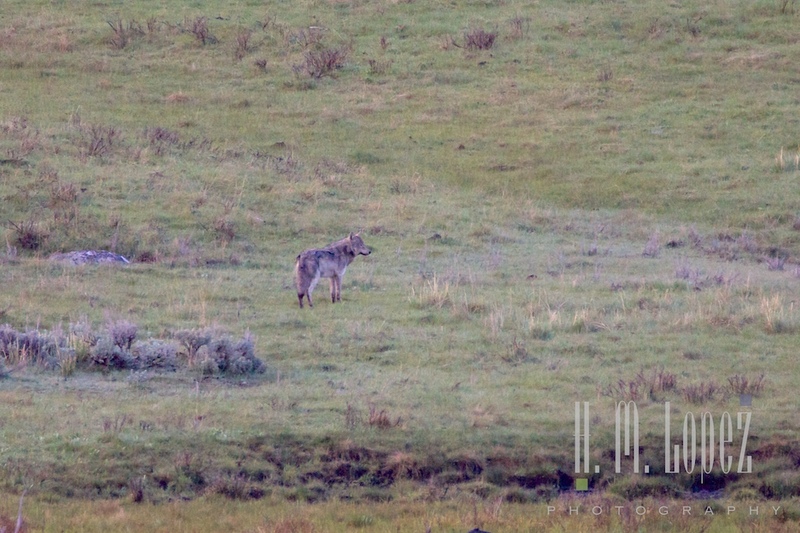 Our carcass watching did not pan out, but we did spot one gray wolf across the way one morning. 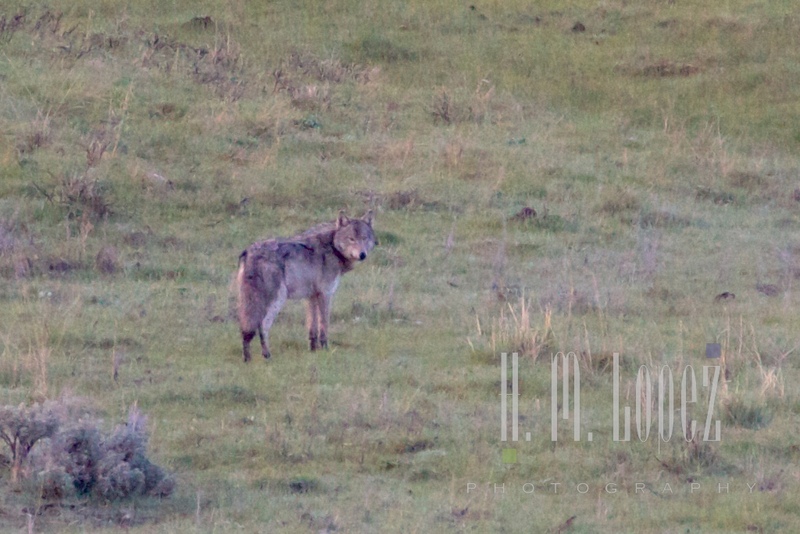 There is a ranger that is the wolf specialist who is out at dawn with a scope who let me look through his scope at the beautiful gray wolf. She too was a bit far, but Hector managed a couple of photographs of this impressive animal. 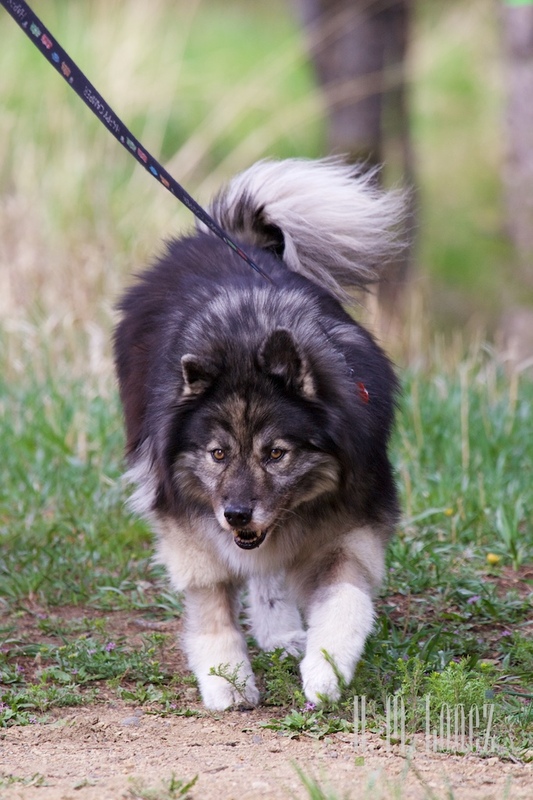 Unfortunately, this was the only wolf we saw. 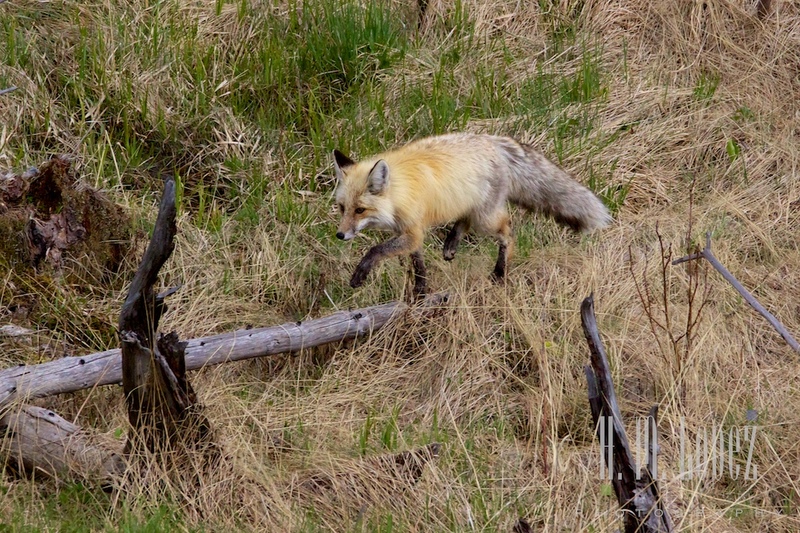 But we did see the impact of the reintroduction of wolves all around us. 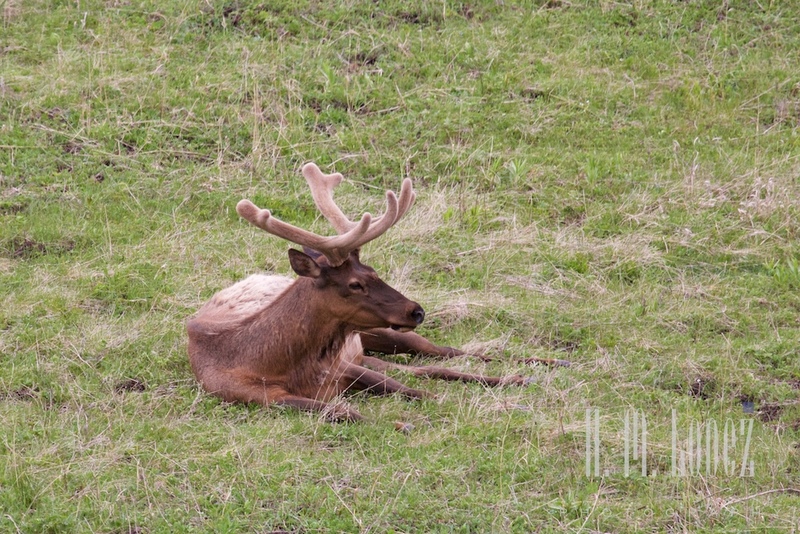 Before the wolves, the elk were abundant and had grown lazy hanging around by the streams eating all day. After the wolves, suddenly they became elk again. Weaker animals were culled (lunch!) 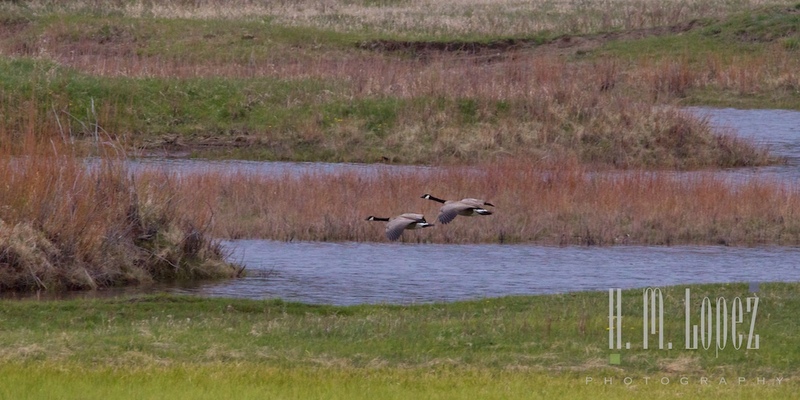 and they were on the move. This caused a “cascade” of impacts. 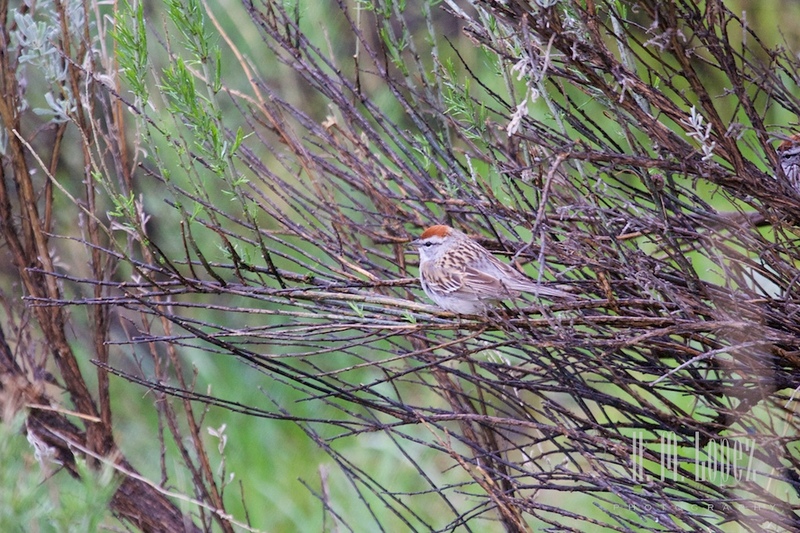 The vegetation near the water grew taller, creating more habitat for songbirds. The taller vegetation cooled the water, bringing back more fish. Which brought back the osprey etc. 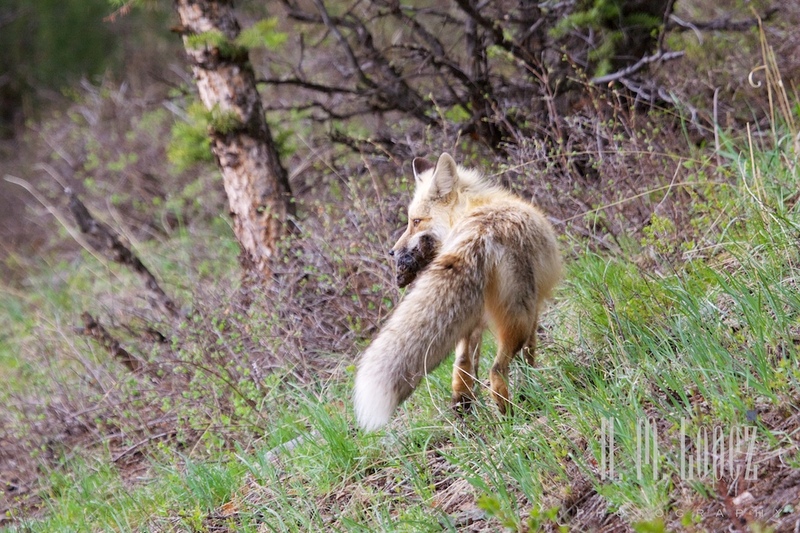 The entire ecosystem benefited by the reintroduction of the top predator. 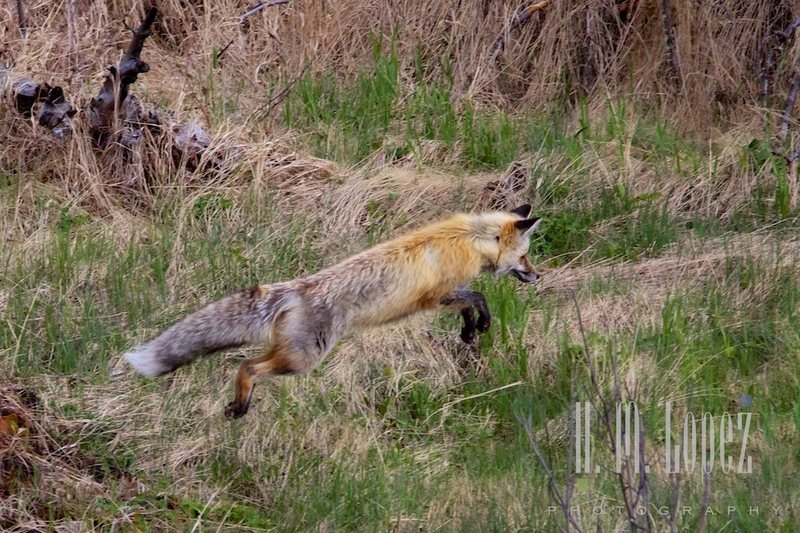 This fascinating sequence is called a Trophic Cascade. Nature is so wonderful. Read a brief description here. 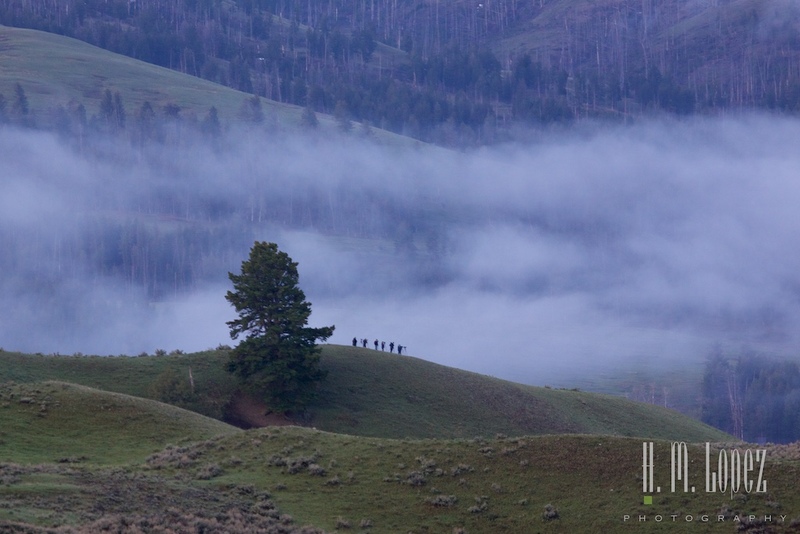 Heading further East in the Lamar Valley, we saw a big group of people looking out into the trees. 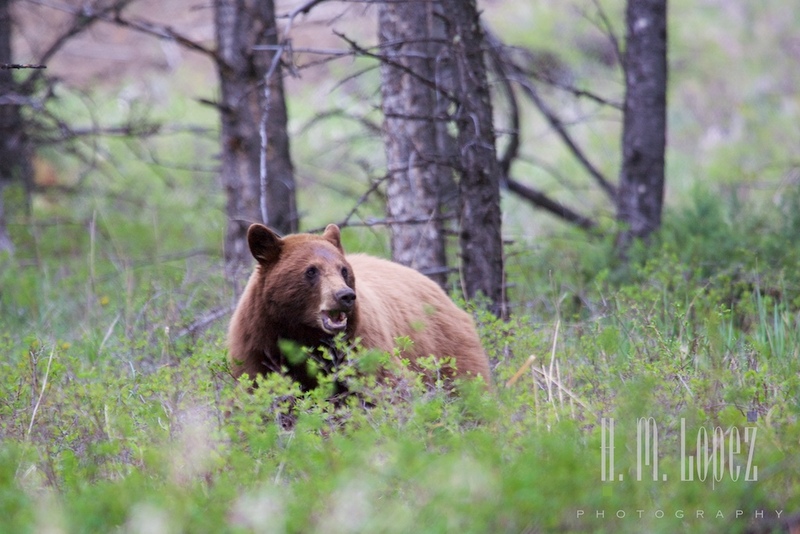 There was a big bear, a grizzly based on his size, sleeping between two trees. I could barely make out his ears through my binoculars. 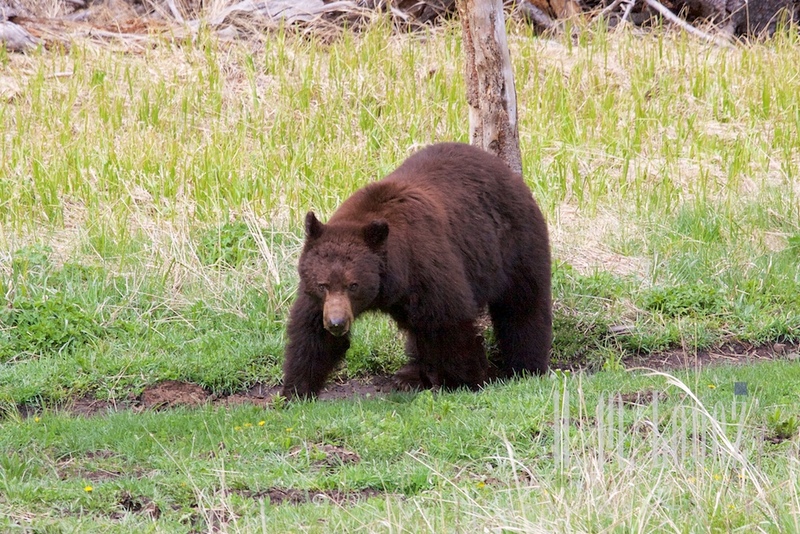 Earlier reports of people who had seen him walking around said he was “Scarface” a very old grizzly who is collared. He caused much excitement. 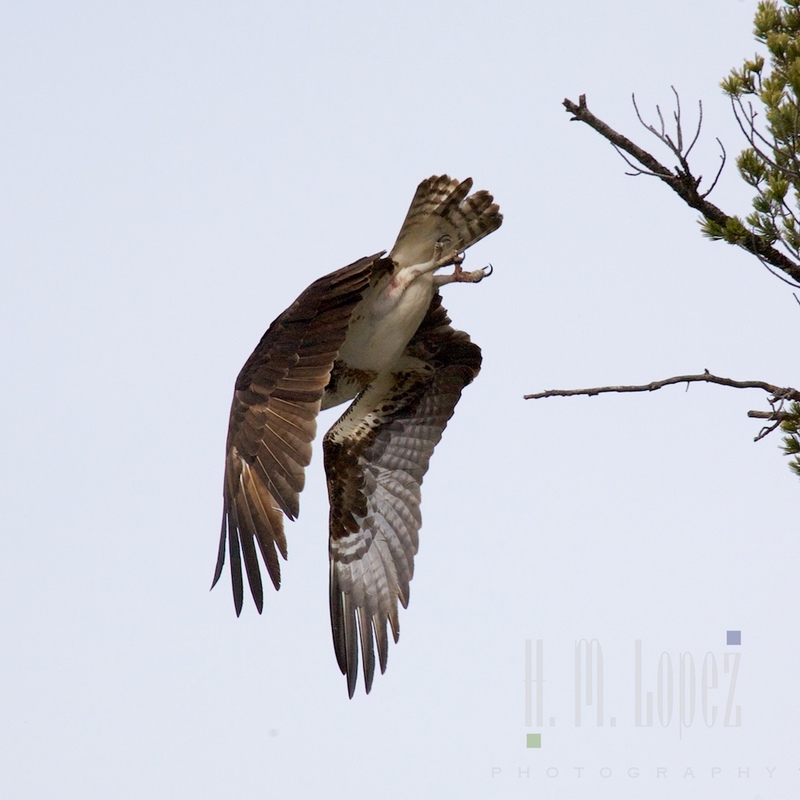 On our return we watched an osprey hunting. 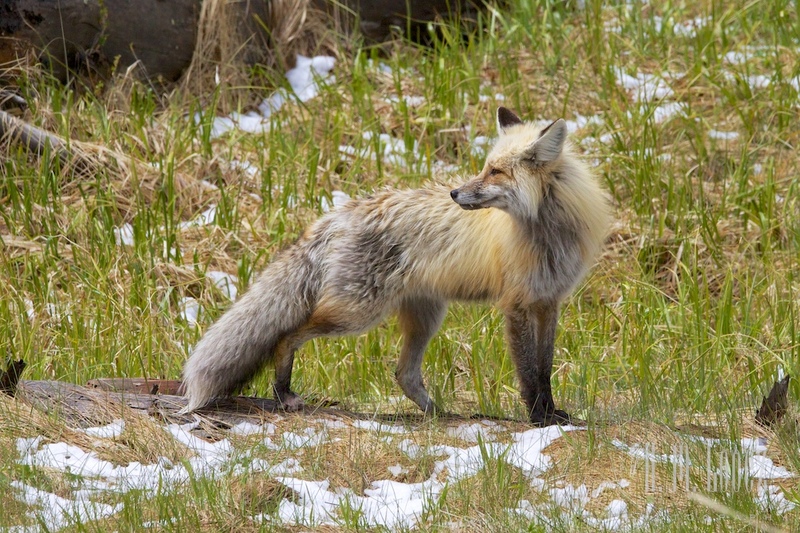 Photographers and wildlife watchers, I realized, are the “other wildlife” at the park. 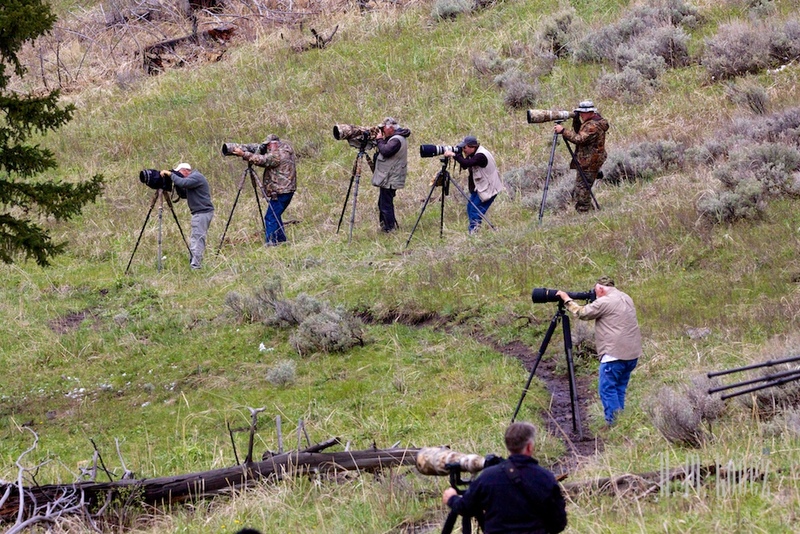 They gather along the roads and hills that are known to be good spots for wildlife with thousands and thousands of dollars worth of equipment. It is pretty astounding. But those groups are great sources of information about where animals have been spotted, and that is how we found out about the great-horned owl and her babies. 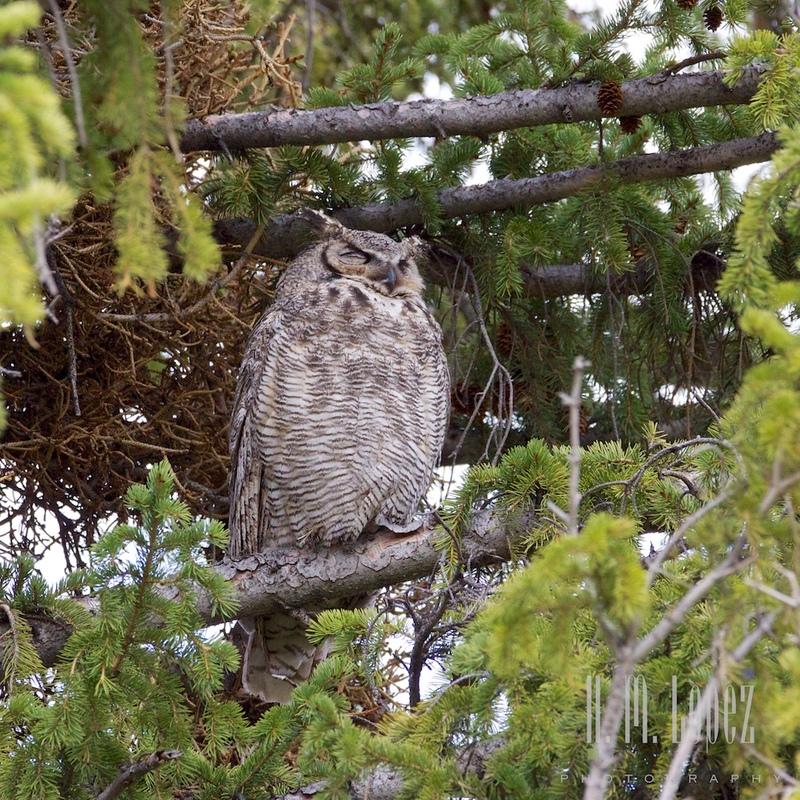 Turns out there is a great-horned owl nest that has been in a tree in the residential area of Mammoth Hot Springs for years. And she had babies once again. This was exciting news and we made sure to stop there on our way back. And there was mama with her two owlets. Absolutely adorable. 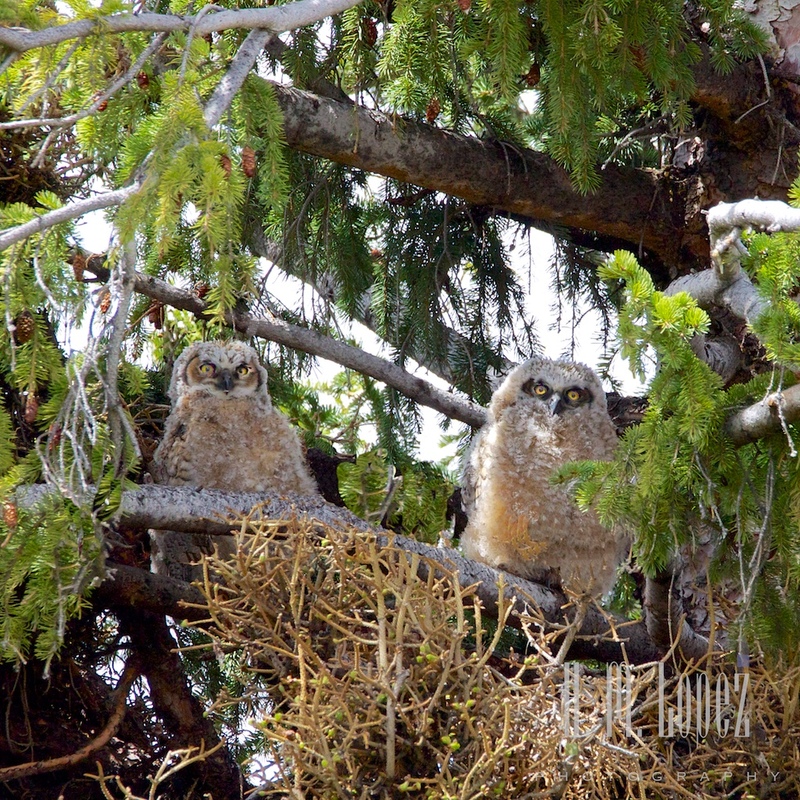 Since it was near our campground, we stopped several times, and most times the owlets were sitting up. Sometimes mama was there, sometimes not. 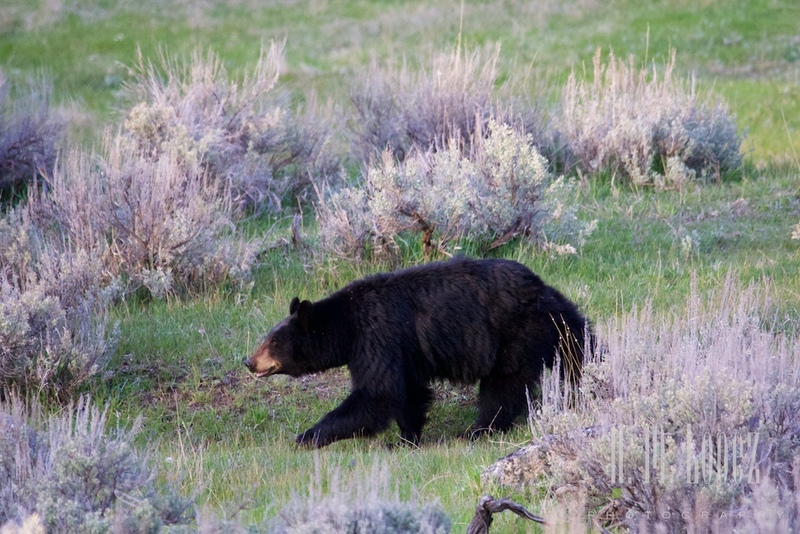 Another morning after returning from Lamar Valley we spotted another black bear, a great big one. He, as all of the other animals was busily feeding. 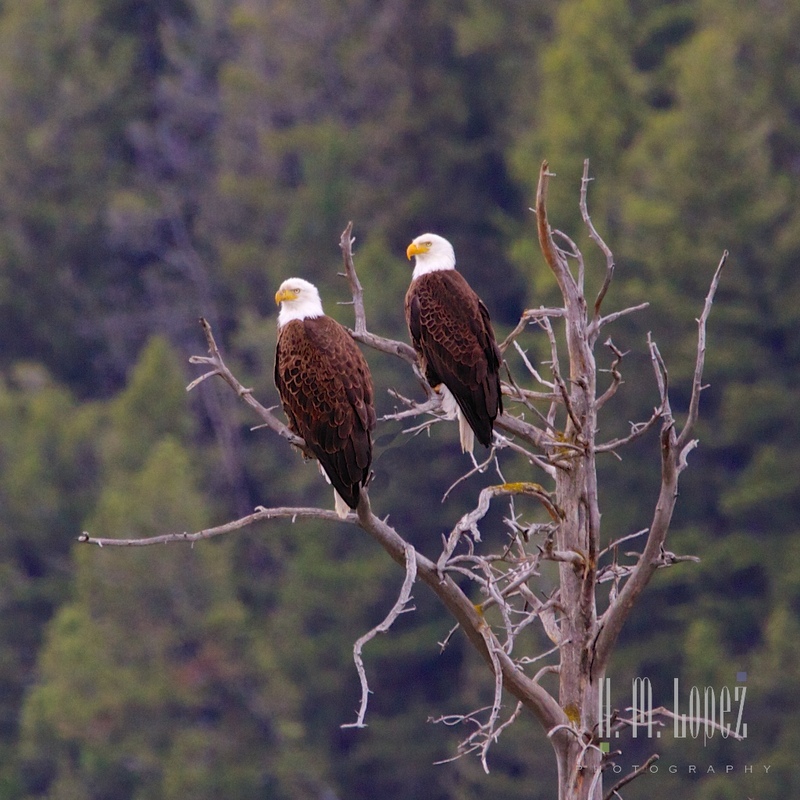 We also spotted two eagles majestically perched in a tree. They were there for a very long time without moving. 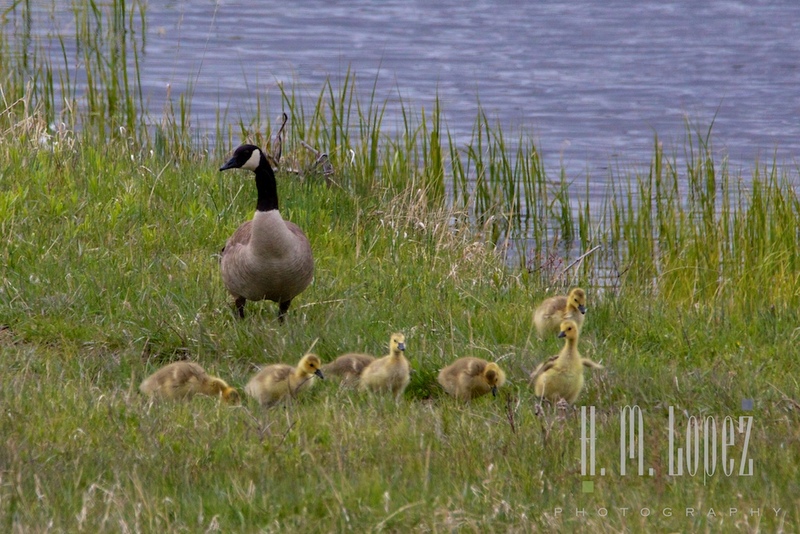 On another outing to Slough Creek, which is a wetlands area we spotted sandhill cranes, another eagle and two geese with goslings – our fourth group of baby animals! 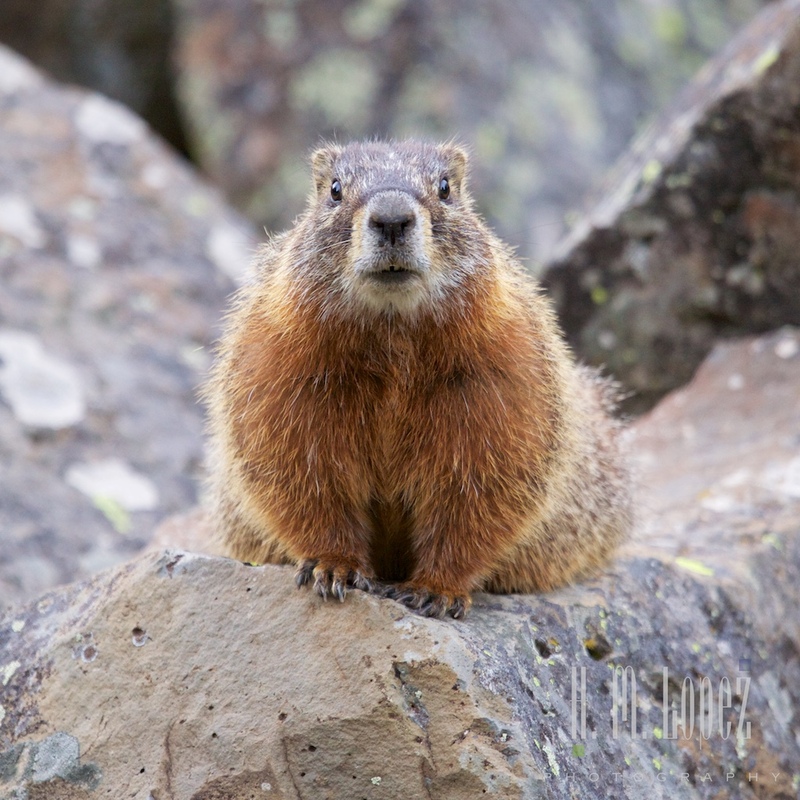 We are always on the lookout for smaller animals, and spotted this cute marmot. We love the marmots. 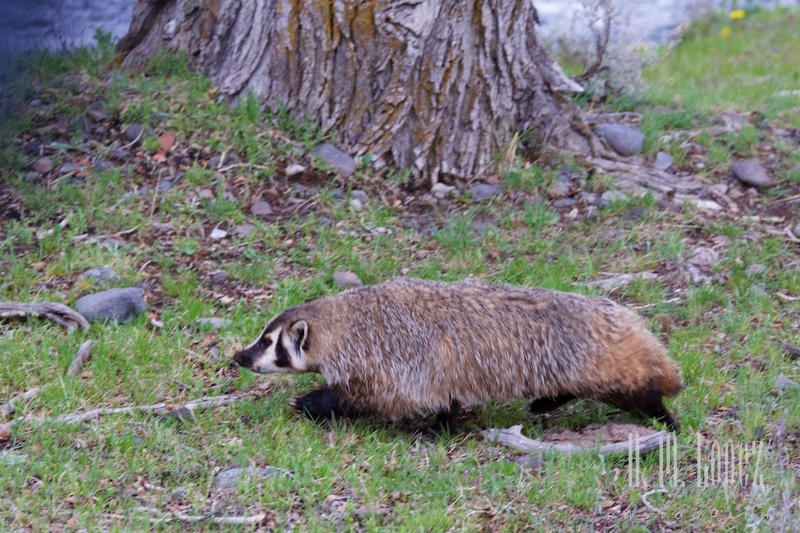 The second time we thought we spotted a marmot, further East on Lamar Valley, it turned out to be a badger, an animal we had never seen before. They are very odd-looking animals. We saw a second one on another day. Apparently they are big habitat builders as they dig huge burrows which then get used as dens by other critters. 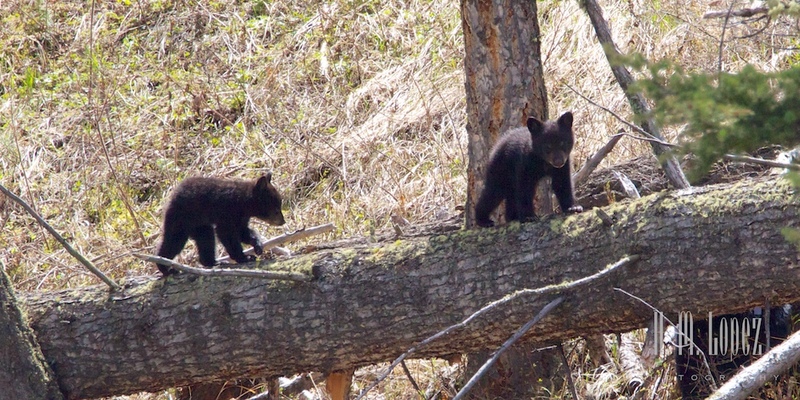 On our last day at Yellowstone, we really wanted to see more bear cubs. No luck. 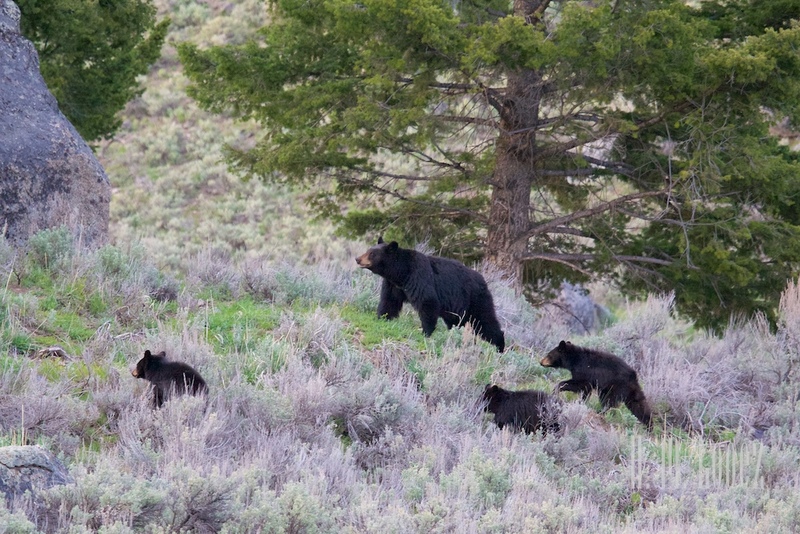 Then towards the end of the day, we heard there were some cubs near Calcite Springs. We bumped into some nice folks we had met earlier at Slough Creek, and they told us the sow and cubs had just gone up hill and laid down, so we waited a while. Finally, they got up. 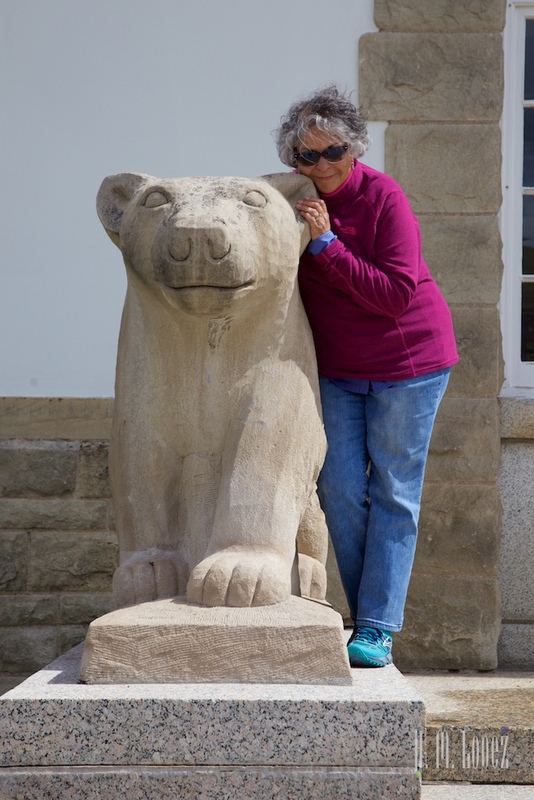 It was a black bear with a black cub and a cinnamon cub. They were rooting around, and the sow sent her cubs up a couple of trees. It was a great ending to our Spring visit. 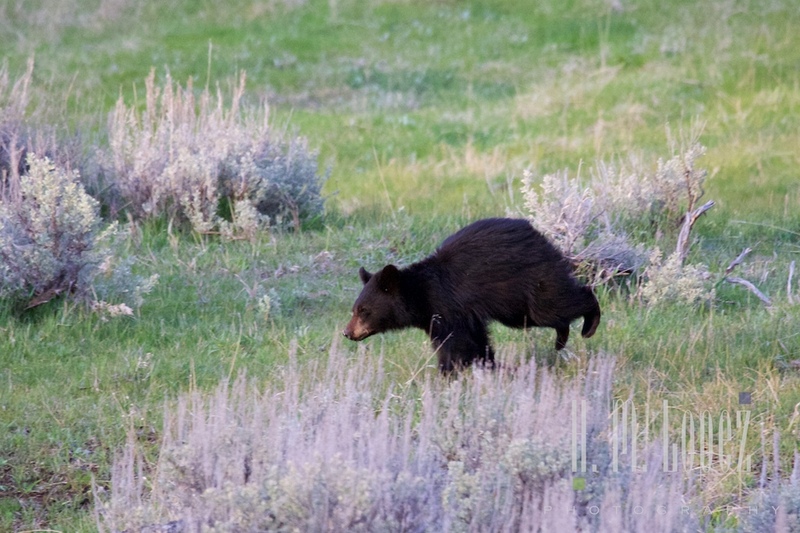 Black bears with cubs, grizzly bears, bison with calves, elk, mule deer, pronghorn, bighorn sheep, a wolf, a fox, coyote, marmot, badgers, eagles, osprey, hawks, ducks, sandhill cranes, herons, an owl with owlets, geese with goslings, mountain bluebirds – an embarrassment of riches! 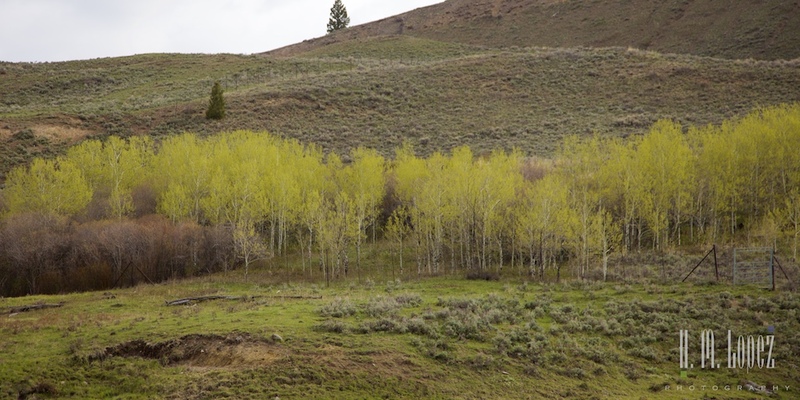 A little later in spring might make for better weather, the elk have their babies later in May, and the wildflowers were just beginning to bloom, so a little later might also be prettier. 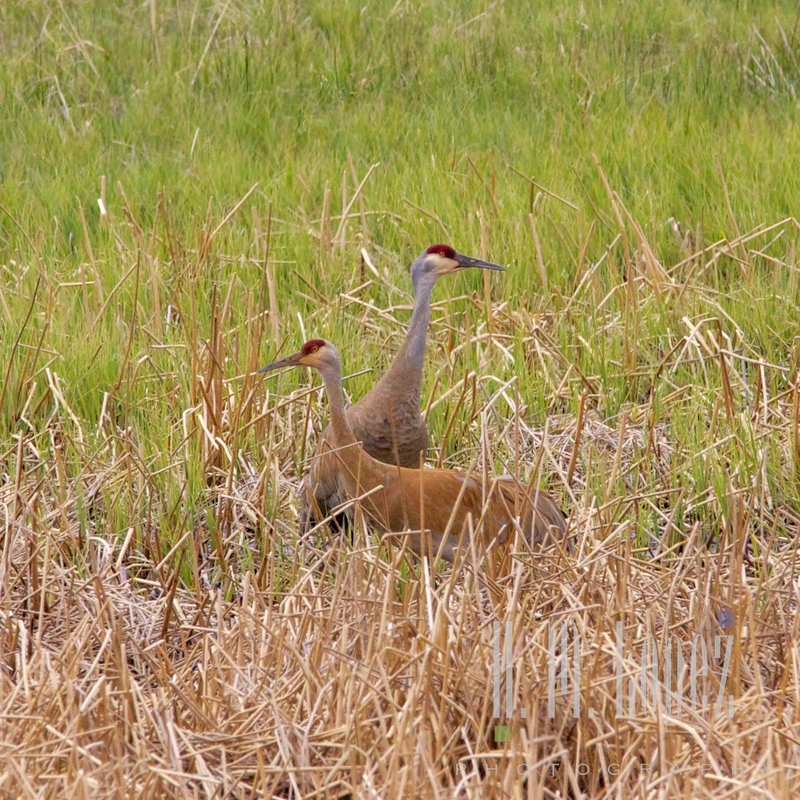 But this was by far our best wildlife-viewing visit to this or any other national park. 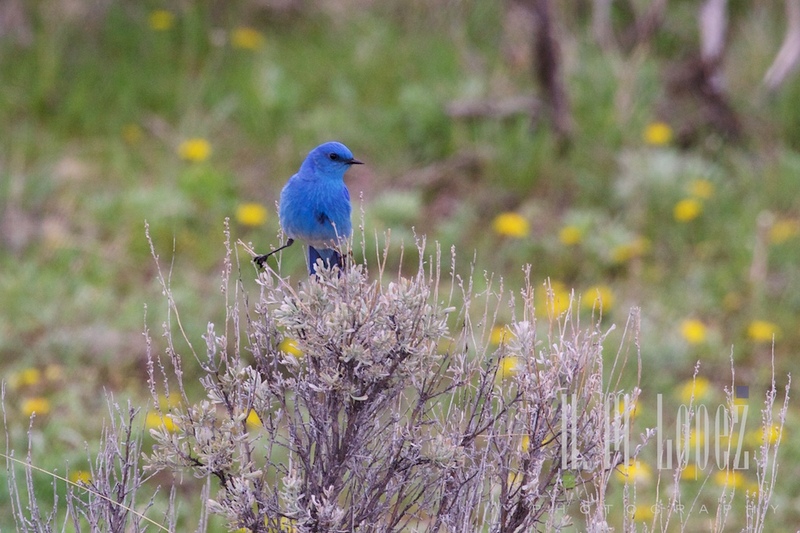 This entry was posted in Montana, RV fulltimers, States Visited, Wyoming and tagged birdwatching, cliffs, dry camping, flowers, forests, museums, national parks, Roads, sunrise, sunsets, waterfalls, wildlife by islandgirlwalkabout. Bookmark the permalink. Oh my gosh, I love your pictures and stories! 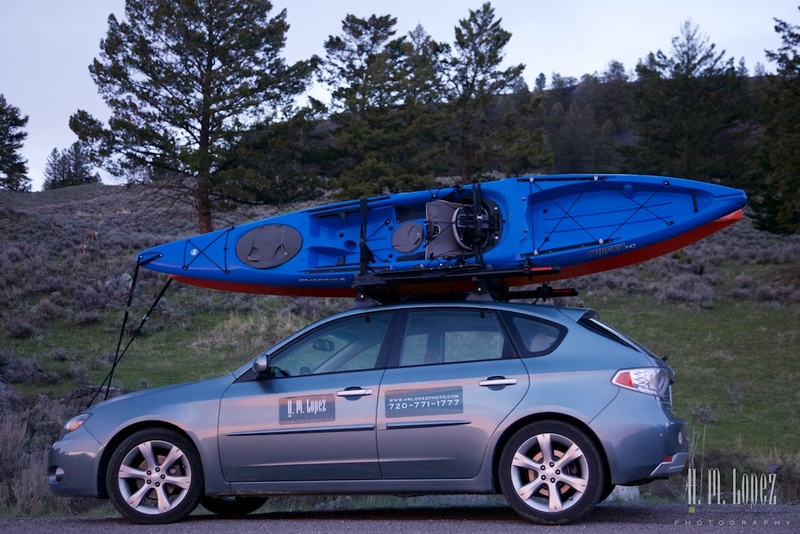 We spent all of June and July in Yellowstone last summer and enjoyed exploring all of those areas you talk about. We saw so many animals, too! Yellowstone is the BEST National Park for us so far. Loved it! Thank you for sharing your wonderful photographs. It’s really a unique park, we love it too! OMG! 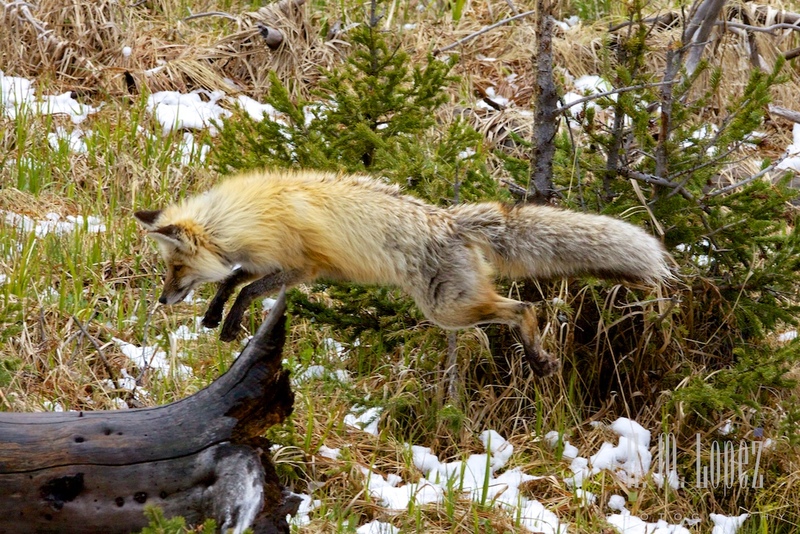 What amazing wildlife sightings you’ve had. I hope we are half as fortunate in September! 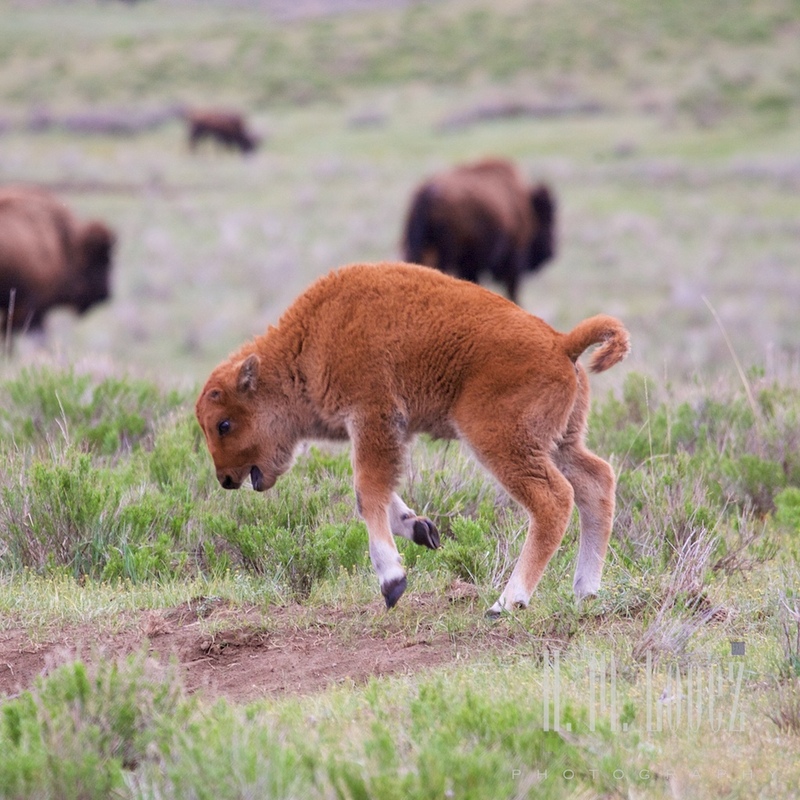 The jumping bison calf is adorable! The badger sighting is quite a find! Never seen one of those before either. I do love the pronghorn. We saw many of them as we moved from Northern NM into Colorado. I’m sure you’ll see lots of wildlife in September as well. Enjoy! 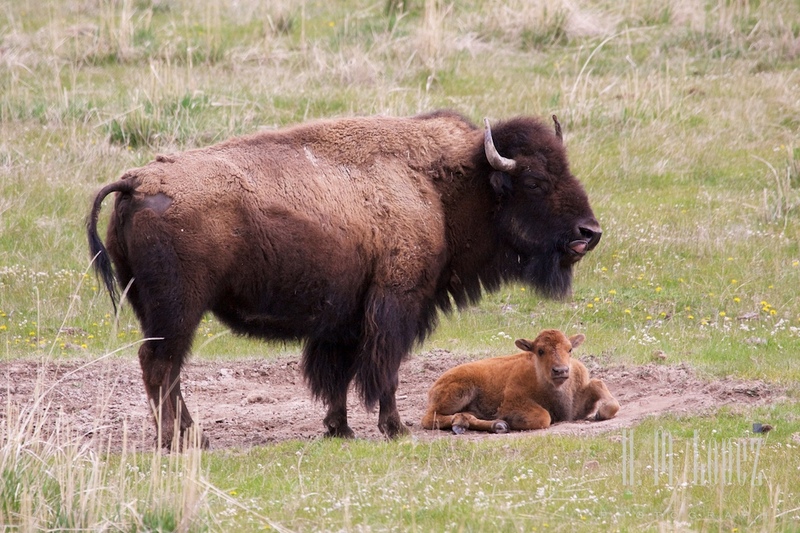 I loved the baby bison and the badger was new for us too. 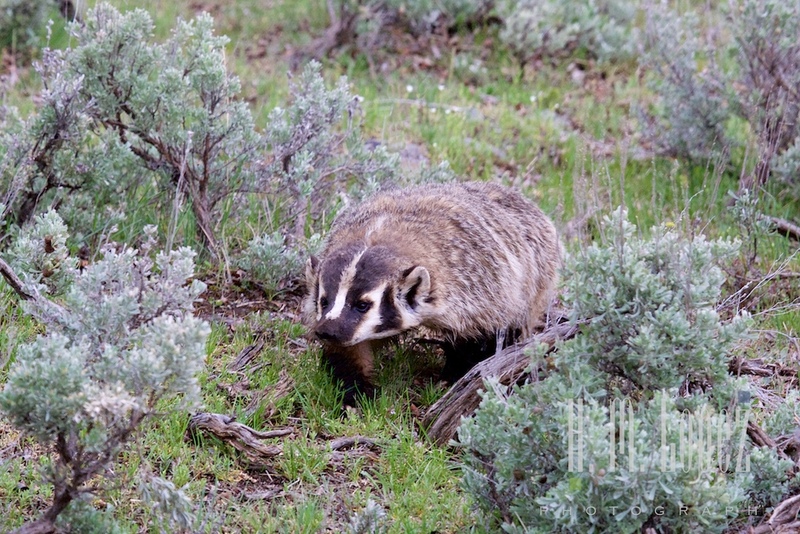 We saw the badgers near the Buffalo Ranch in the Lamar Valley, be on the lookout in that area. 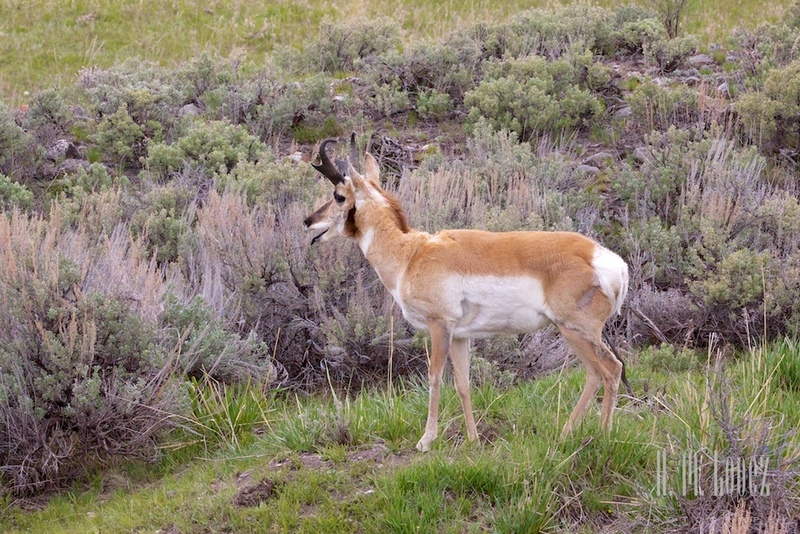 The pronghorn are so unique, but they are quite skittish. Love Hector’s photography expertise, it brings great inspiration. Would appreciate lens recommdations for these types of pictures where you can’t get close. Thanks, Pam! The cubs are so precious, we love watching them. 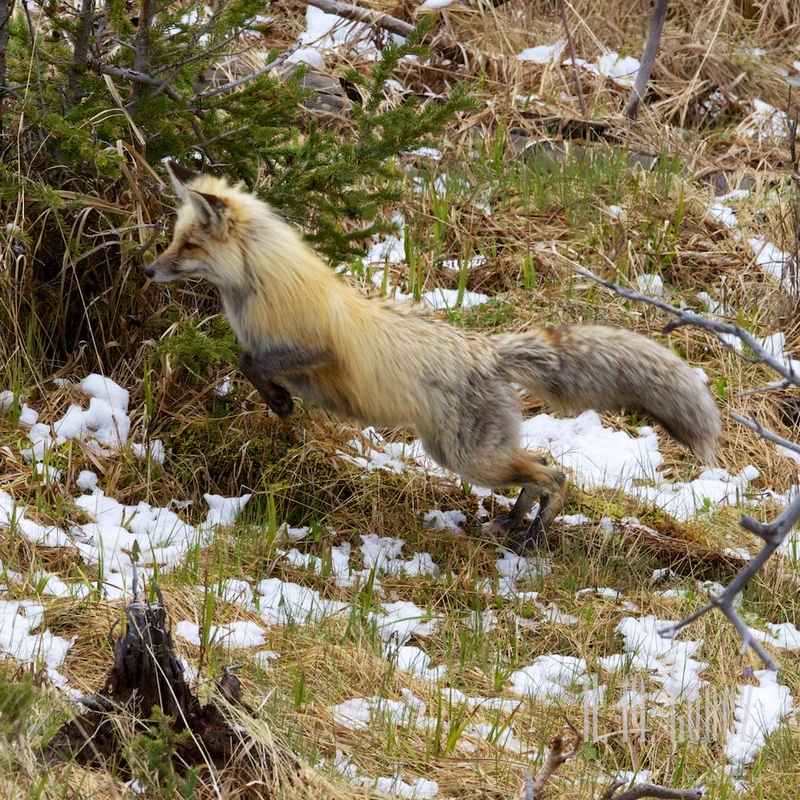 And the fox was incredible, what a coat! The owls are in a tree by the residence a few doors down from the visitor center that has a metal ramp – the nest is on the opposite side of the parking but mama owl perches on both sides. 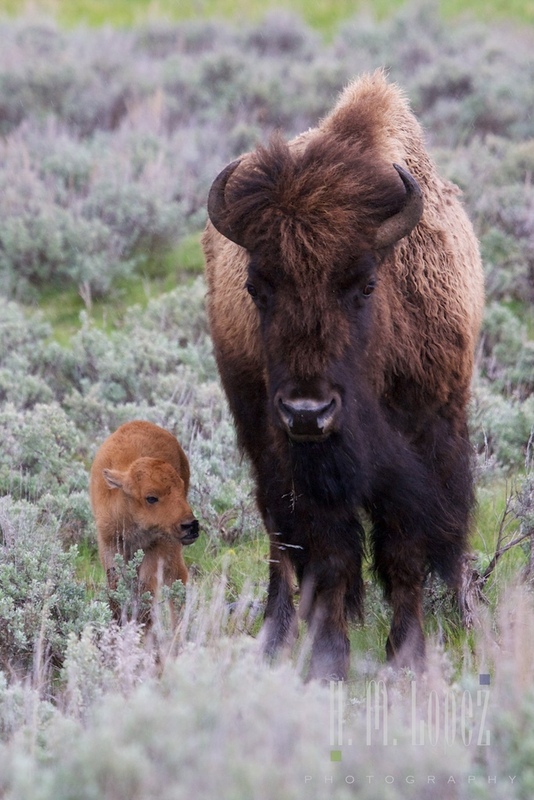 We love the baby bison too. The badger was quite a surprise. So glad you enjoyed! lol. Thanks, we love to learn about the animals. 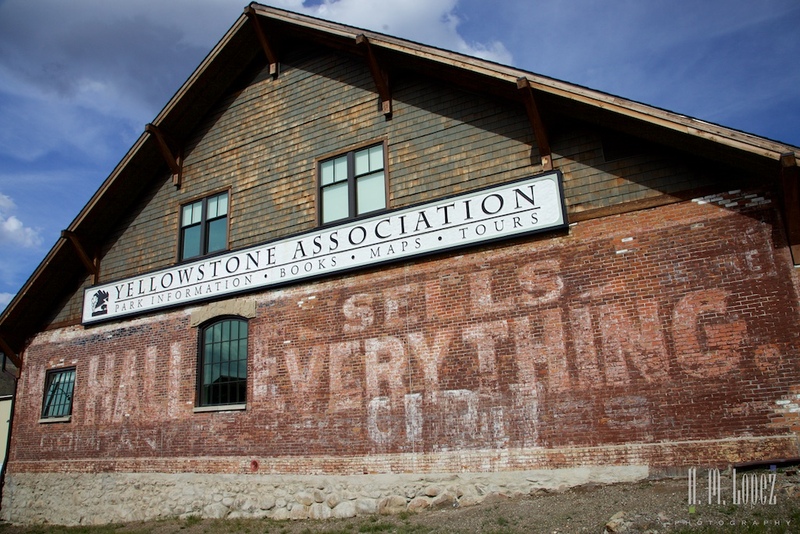 In fact, we were talking to a guy out by the old buffalo ranch who told us that the association gives workshops. He specifically mentioned winter, which I thought was interesting. I imagine you have to be a member. Are you familiar with those workshops? 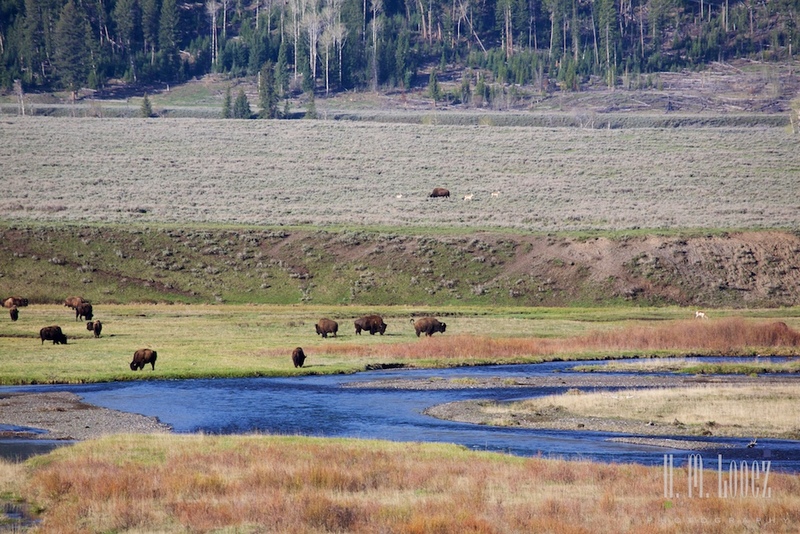 Just loved reading the posts on Yellowstone–it brought back great memories of our visit there back in August 2012. The pictures are spectacular. I have been following your blog for some time now and many of the places you write about we have also explored. I guess that is not that not surprising and almost a matter of course when living this nomadic lifestyle. Due to financial and some health issues my partner Monte and I have been forced to stay put for a few months so I am looking forward to reading your next adventure especially if it takes place somewhere we haven’t been yet. Happy Trails! Thank you so much and welcome to our blog! There are so many beautiful places to see. We have just entered Canada and are on our way to Alaska and are glad to have you along! I hope everything works out for you and your partner. So happy you are still along for the ride! Love to all of you! Great selection of animals. Wonderful that you can photograph them and identify them. Very cool! 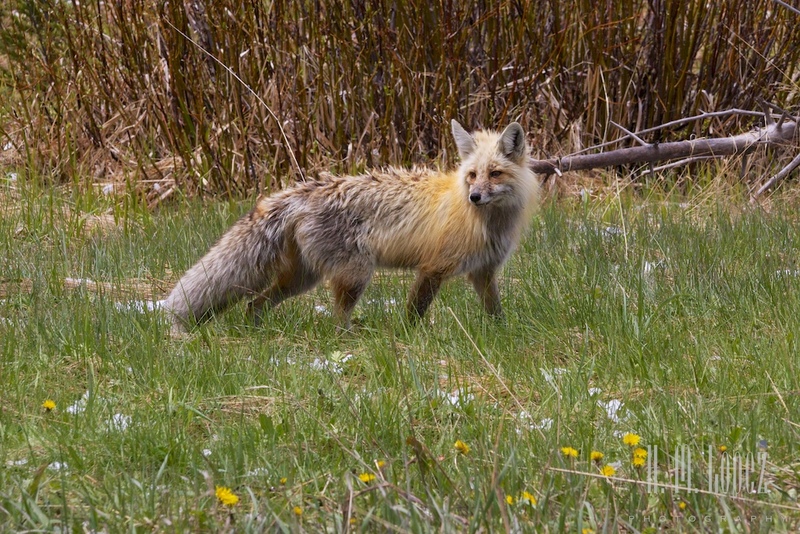 Yes, we are hoping to see even more animals this summer – we love seeing them! I cannot begin to tell you how much I enjoyed this post. The pictures are amazing. As you know, this week we helped Louie and Linda purchase their 40.5′ motorhome from a neighbor of ours. They are embarking on a similar journey! They take delivery today. Who knows, Barry and I might do the same thing in a few years. We’ve got the bug also. Meanwhile, we live vicariously through you guys. So glad you enjoyed it! We heard about Louie and Linda,yay! 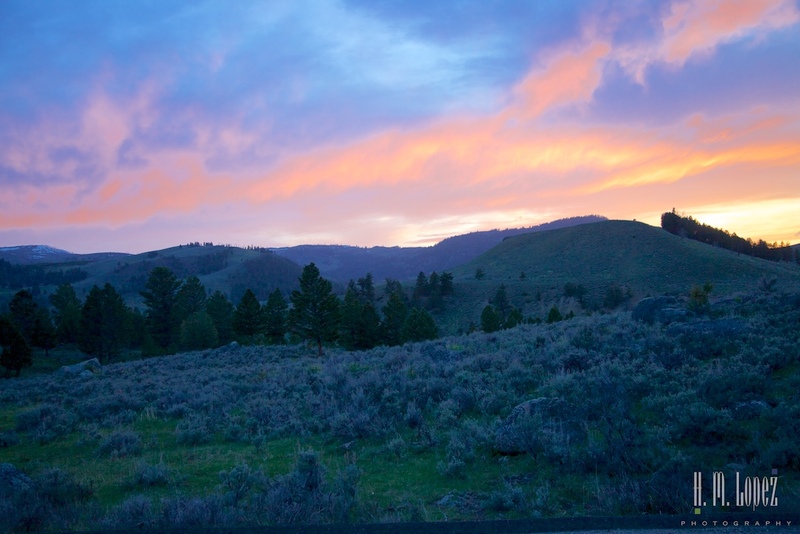 I think you would love RVing, and coming out West to enjoy some different bicycling and other adventures. 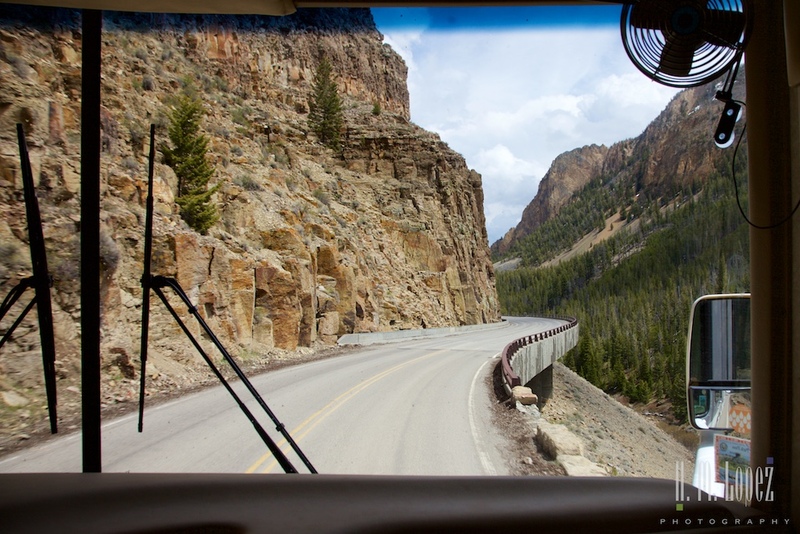 Consider a smaller RV if you have a choice, and call us with any questions. Meanwhile, maybe you can fly out and join us sometime. Miss you both! Great post! Just makes me want to go back and spend some more time there. We just got back from Crater Lake in Oregon. We really want to go there, but timing hasn’t worked out – glad you got to go. 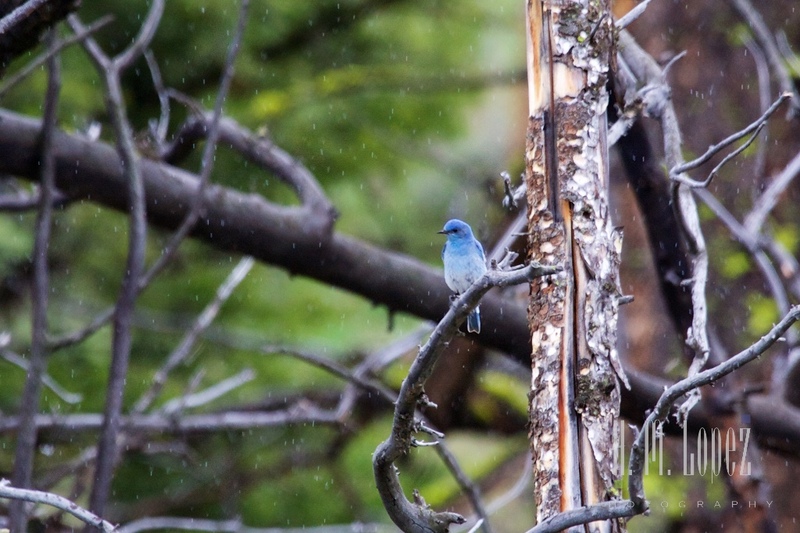 I couldn’t believe all the rain in Colorado!